Where To Go | sausageheavenoutdoors Enjoy making homemade sausage, Tasty way's to BBQ, smoking meats and poultry. See how northern Minnesota was settled and the life early homesteader's lived their lives and more!! This page will give you information on places I have been with detailed information included. 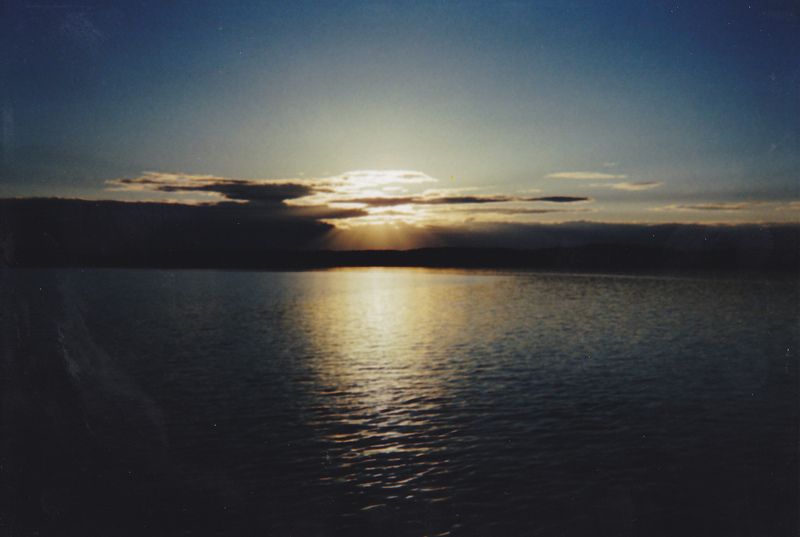 I will try to give you the best and honest reports on Lakes and Rivers I have been too and current conditions as well. 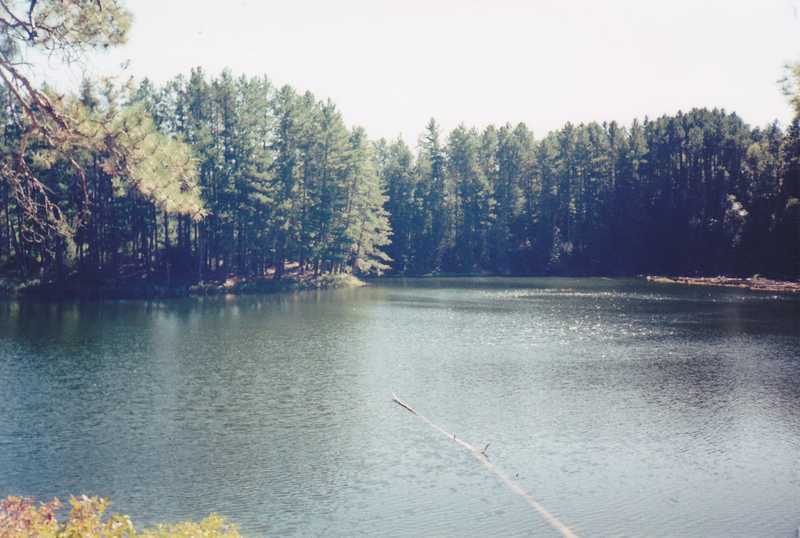 I have fished the Arrowhead region most of my life. 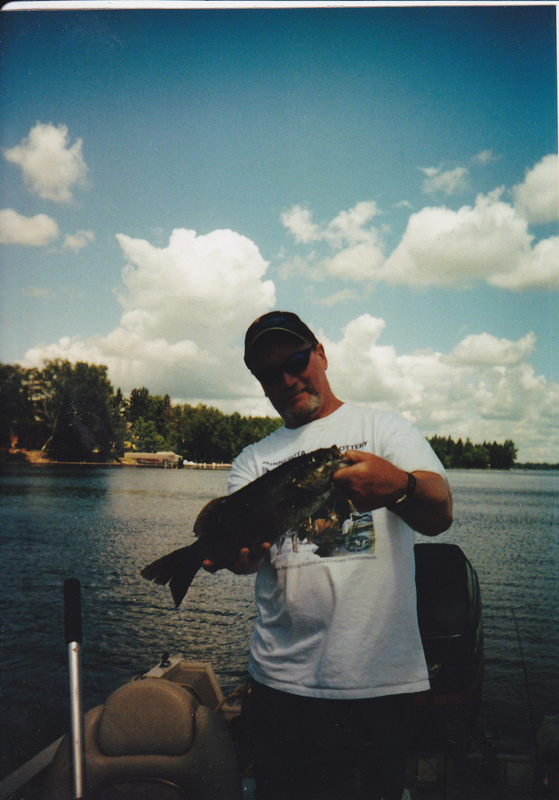 I have also fished the metro area of Minnesota as well as other areas of the state. What baits have worked for me, water color, structure, fish size average, species available, and more. One thing I always was interested in before I go to a lake I have never been too before was, what is the boat landing like. Can I bring my 18 foot Chrestliner, canoe, or 12 footer. Nice to know if it’s gravel, concrete, shallow, or deep. Docks, and parking info is important as well. Should I bring bait or is there a good bait shop nearby? If you have any questions on water’s I have been to please leave o comment and I will answer them as best as I can. This page will be added to with updates on places I have already posted and many new spots will be posted as well. 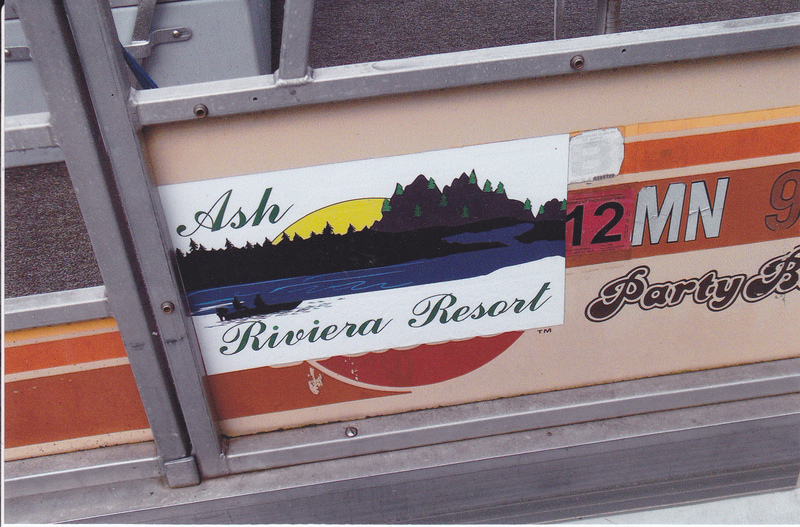 My family went to the Ash River Trail last June and stayed at Ash Riviera Resort. The resort is owned by friends of mine who I have known for many years. We are going back again this June for another week of great fishing. 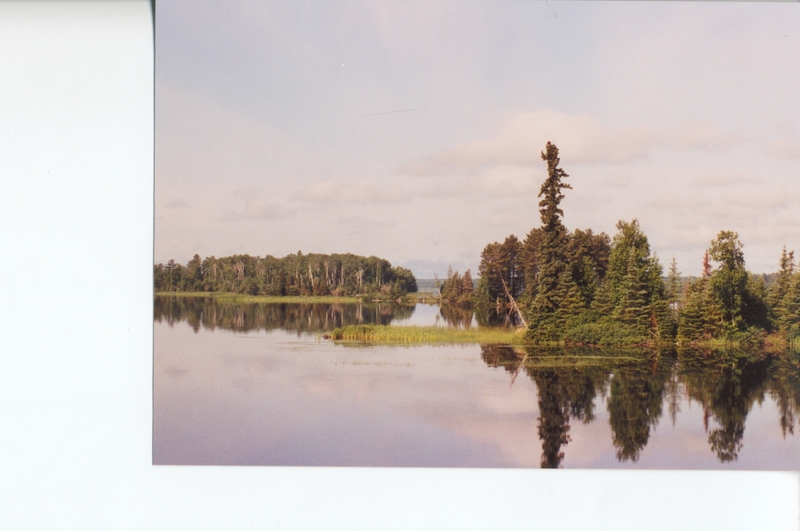 The Ash River empty’s into Sullivan Bay, which is the gateway to Lake Kabetogama, Rainy Lake, Namakan and more waters to explore. My daughter, her husband, and my granddaughter came with us so I didn’t bring my boat along. We rented Chris’s [the owner of the resort] large pontoon boat for the week. I haven’t used the boat landing yet which is just up the road from the resort. However from what I can see, large boats can be launched and parking looks ample. 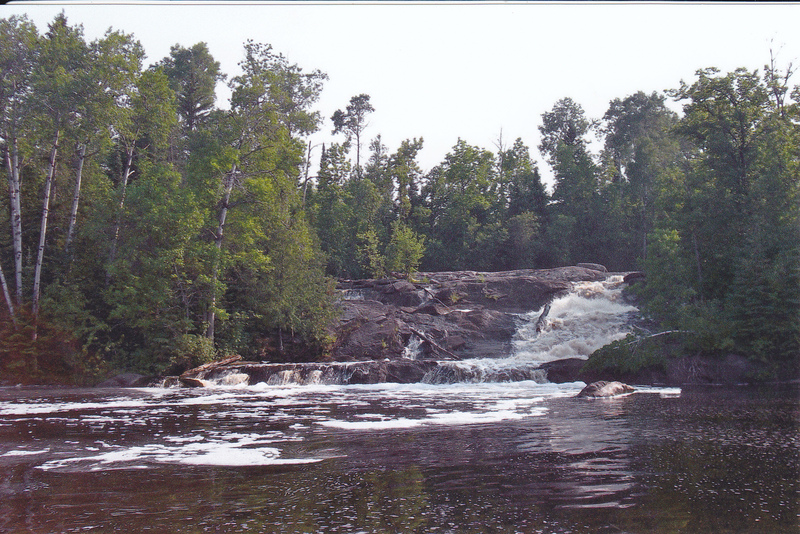 We boated up the the Ash River falls and fished downstream from there. We went up the river mainly for sight seeing but did fish it some. We parked the pontoon close to the bank of the river and caught some walleys there. We used leeches under a slip bobber. The water where we fished was about 5 foot deep. The biggest walleye in the river was 23 inches. There is a slot in the Kabetogam Lake area of 17 inches and under for keeping. The best fishing we have had in a long time happen’d here. 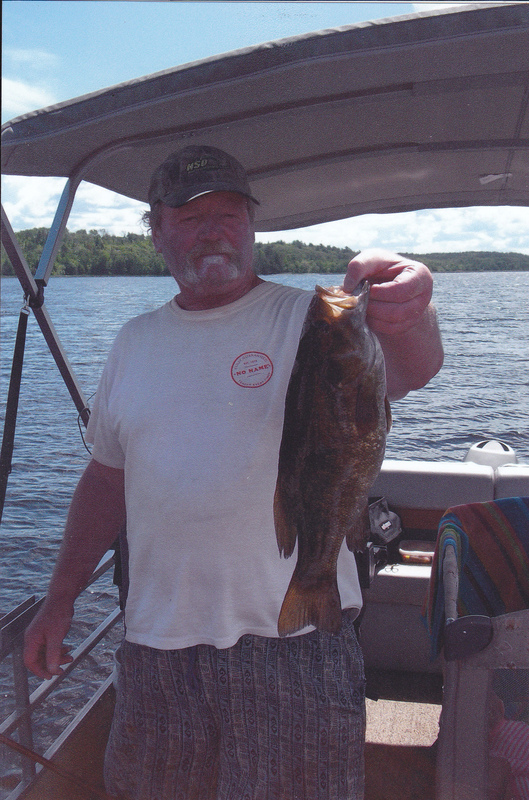 We didn’t even make it out to Kabetogama because the fishing was great right in Sullivan Bay. I anchored the pontoon in 8 feet of water off a main point, just inside of a bay. Because we had a few people in the pontoon bobbers and leeches was all that we used. Have to say, nothing else was needed. I put the Aqua View camera down so my grandson can get entertained while waiting for the bobber to slip under the stained bog colored water. On the camera we saw many large perch, a couple of pike and walleys swim by. As you will see from the pictured we caught many fish. 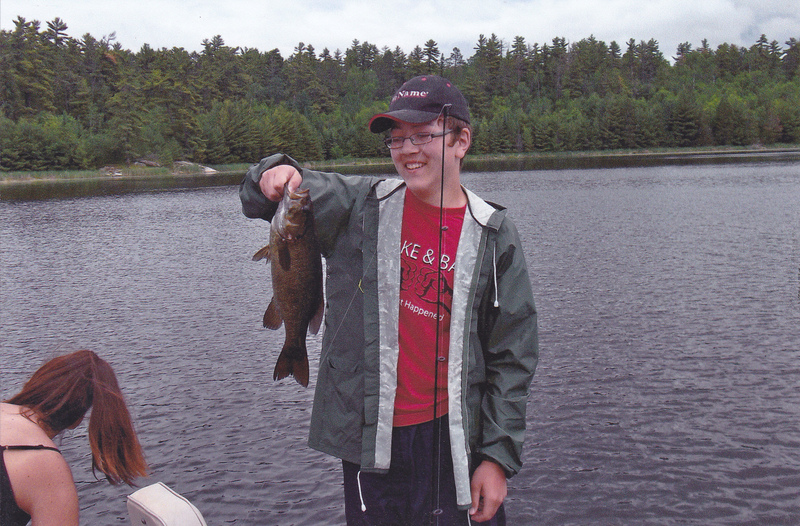 Largest walleye was 27 inches, largest perch was 14 inches [most ran 10 to 12], and the largest smallmouth was 21 inches. I have to say that the average size perch and smallmouth were unreal. 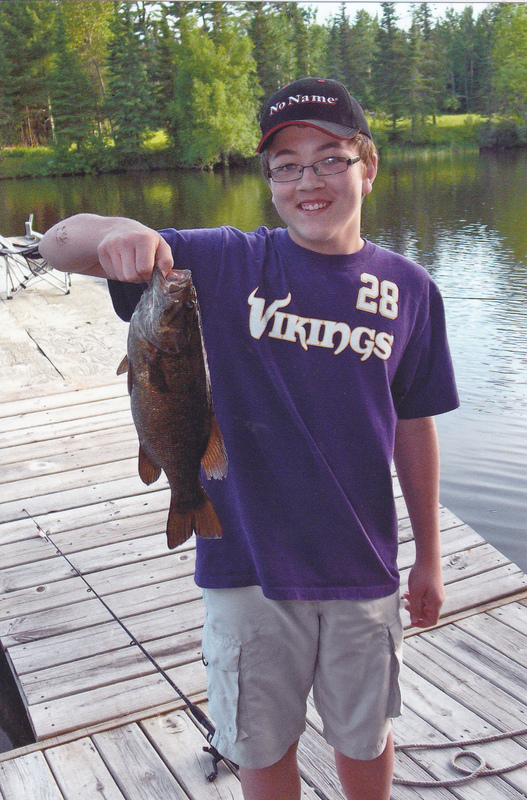 My grandson caught two smallmouth right off the resorts dock by the river that were 20 inches apiece. 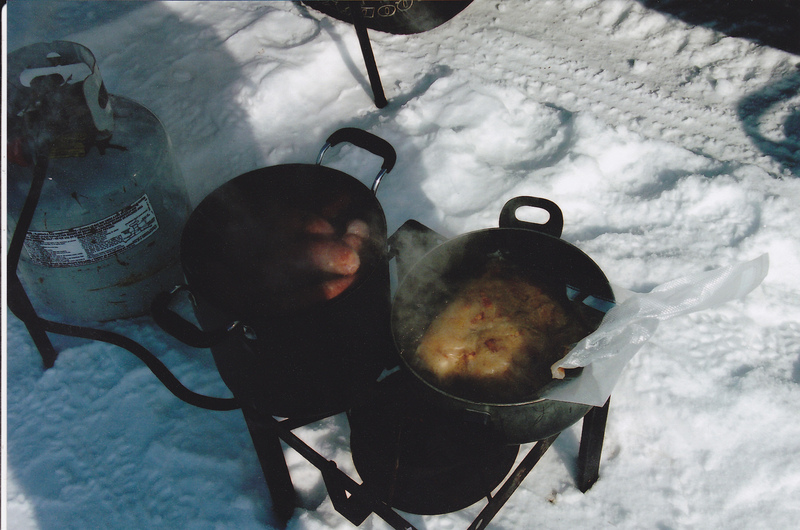 The walleye’s that we caught for the most part were over 17 inches but we did get some for frying. 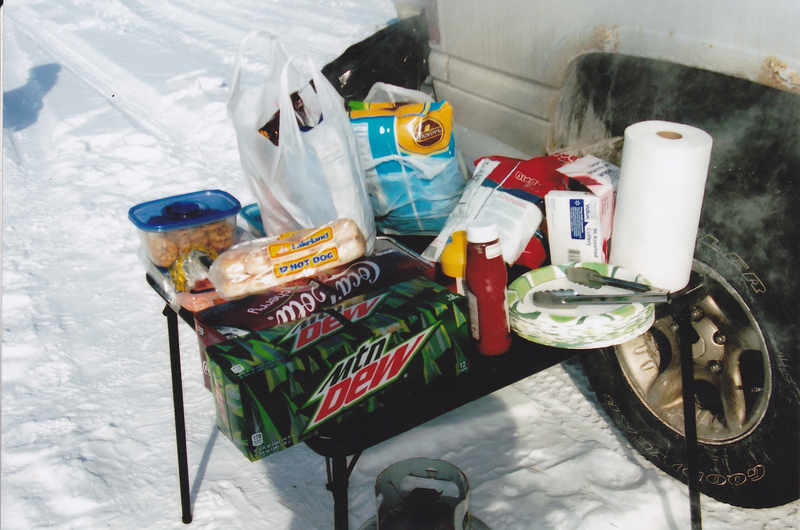 The large perch made up for any lack of walleye fillets and no complaints from us. We didn’t get many pike but we didn’t fish for them this time around. 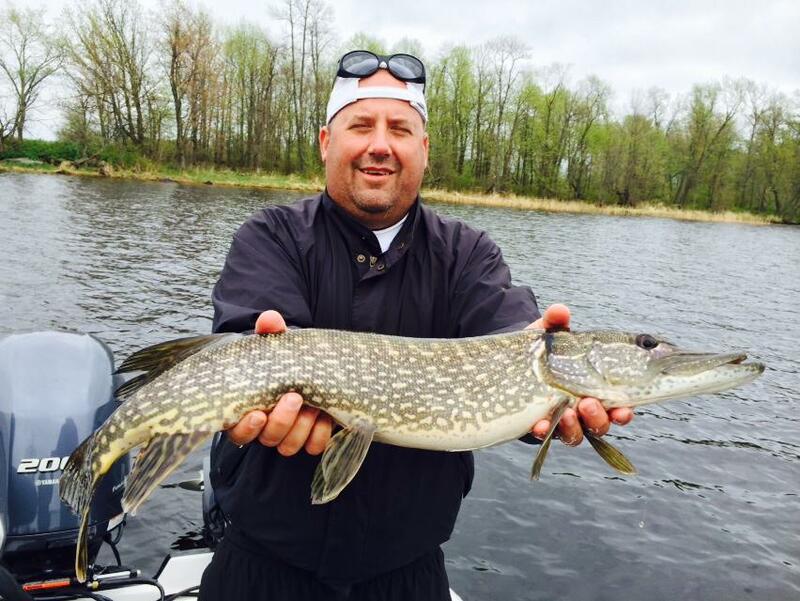 There are many spots for pike and we will go after some of them this June. My grandson Tyler holding on to his line with a nice bass on the other end waiting for me to help him. Going down the river toward Sullivan Bay. There is a no wake zone until you enter the bay. It’s a nice scenic ride. As you make your way down the river you can stop here for a meal and a cold one. 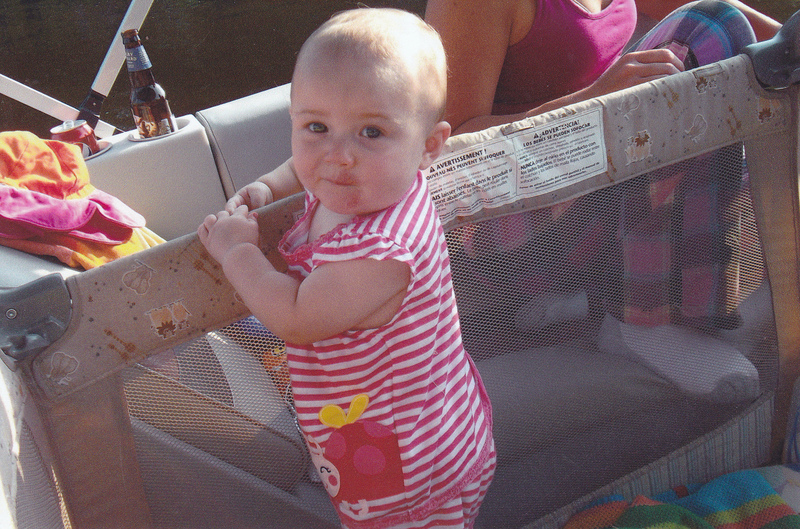 My granddaughter was a real sport in the Pontoon Boat. Nice things to see as you go down the river. 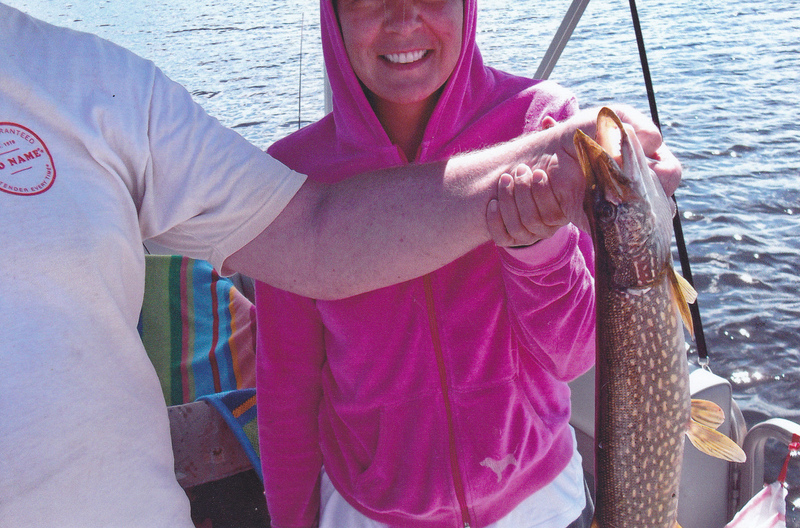 My daughter with a small pike she caught off the dock. 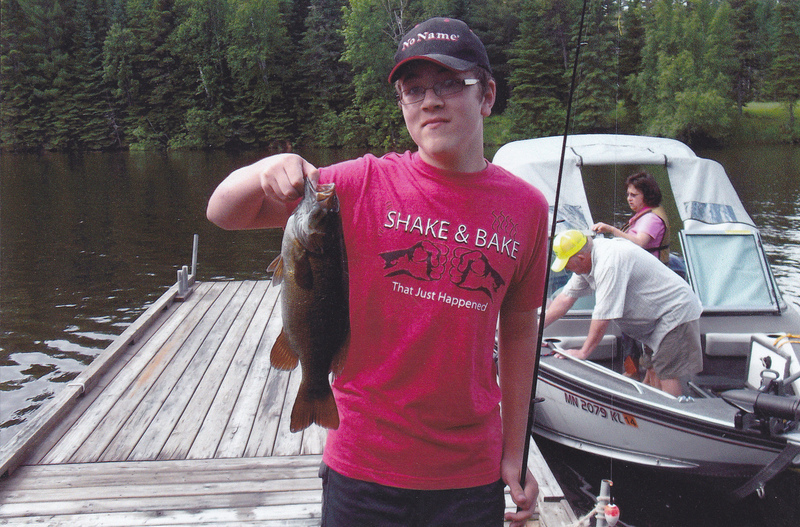 Tyler with a nice smallie he got off the dock. 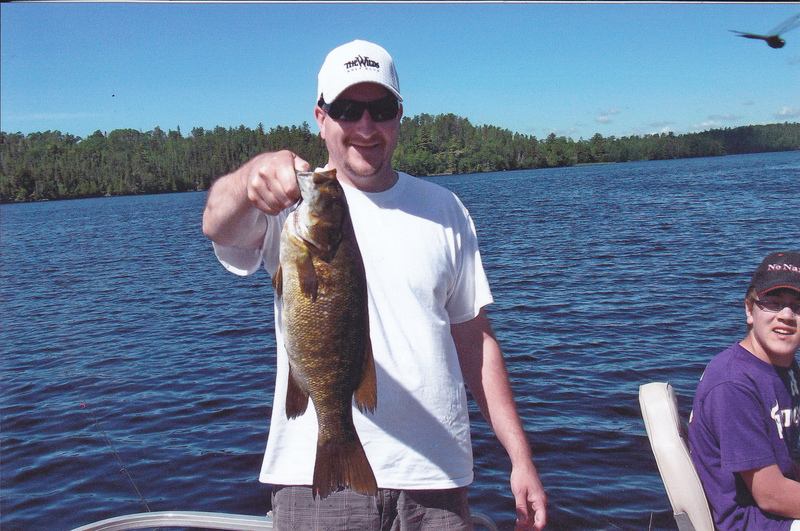 My son-in-law Clay who came to visit us with my oldest daughter for a couple of days, with a nice smallie. 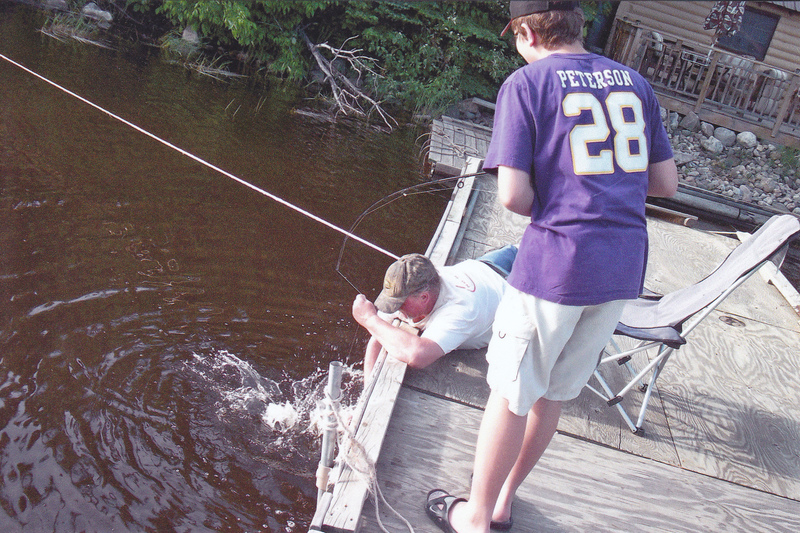 Here I’m helping Tyler with one of his 20 inch smallmouth. Quick picture and a quick release for this nice eye. My son-in-law’s personal best smallmouth. I have never seen so many large perch and smallmouth anywhere caught in one area. 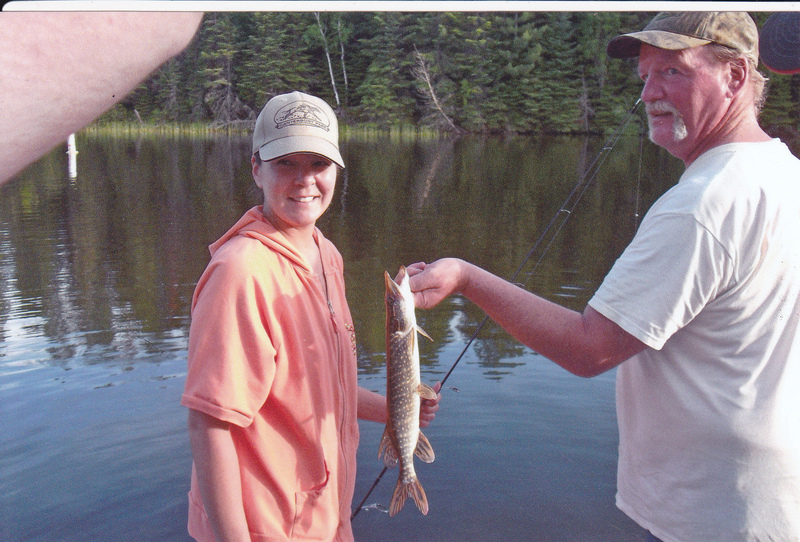 My daughter with a bigger pike that she wanted me to hold. She’s a little leary of the pike’s teeth and gill plates. 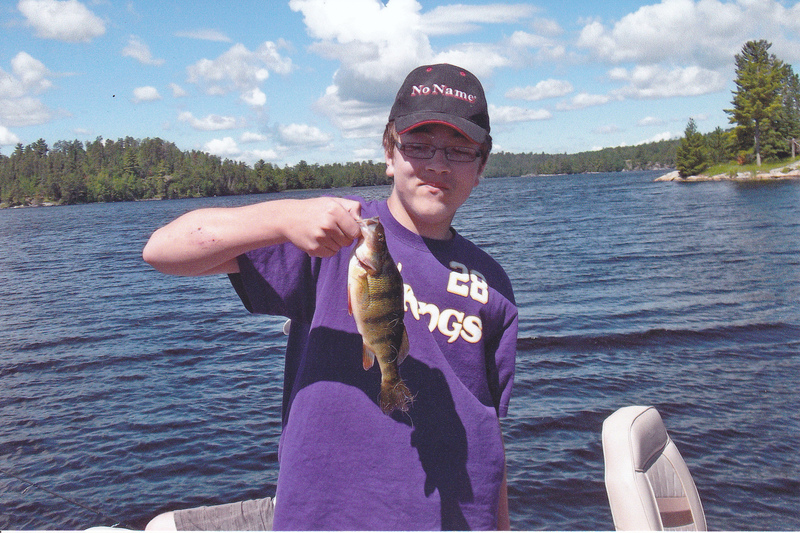 Tyler with a nice perch. We caught many like this. Here I’m holding a nice smallie. Lot’s of sun lotion on this trip. The fish will bite well mid day due to the stained water. Our favorite resort to stay. A waterfall greeted us flowing into the Ash River on our way down to fish Sullivan Bay. A couple enjoying the day in their kayak’s got up close to the falls to take some pictures. My grandson Tyler ending the day fishing off the dock and taking it easy at the resort. 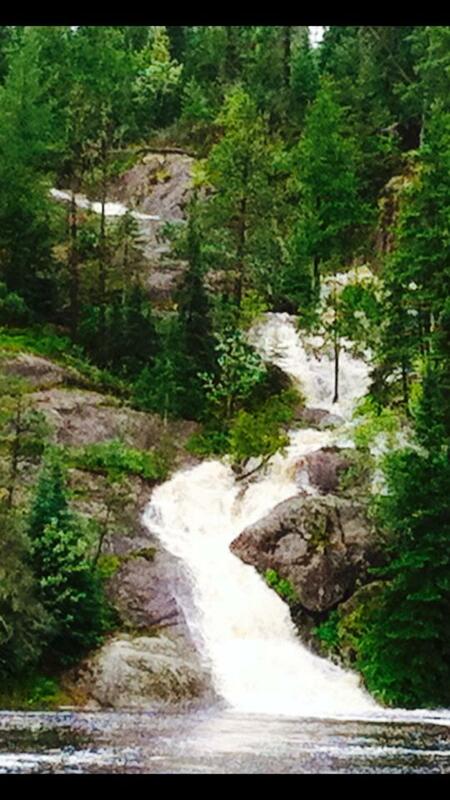 This is Ash River falls. This is as far as you can go by boat. Wild flowers right behind our cabin we rented. Tyler had his way with the smallmouth on the trip. None were under 15 inches and most were close to 20 in. We caught many walleye’s but most were over 17 inches. We did get some eaters like this one as well. 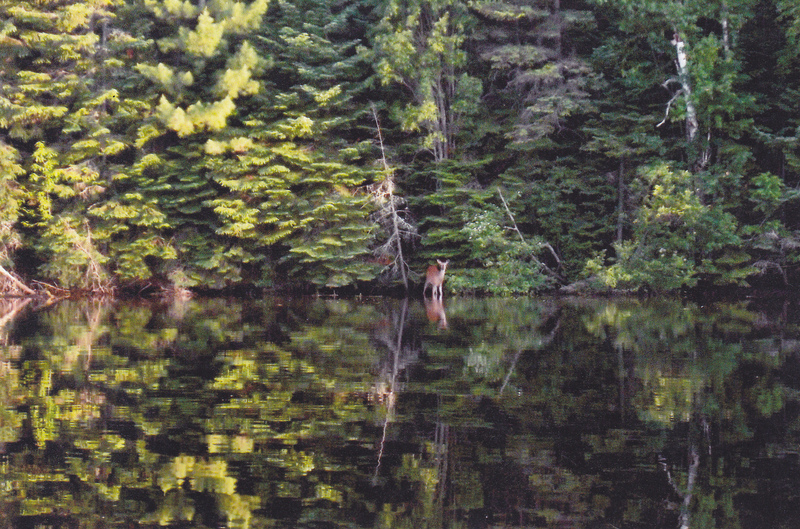 We had deer come down for water like clockwork every day toward late afternoon. Cant wait to get back there. 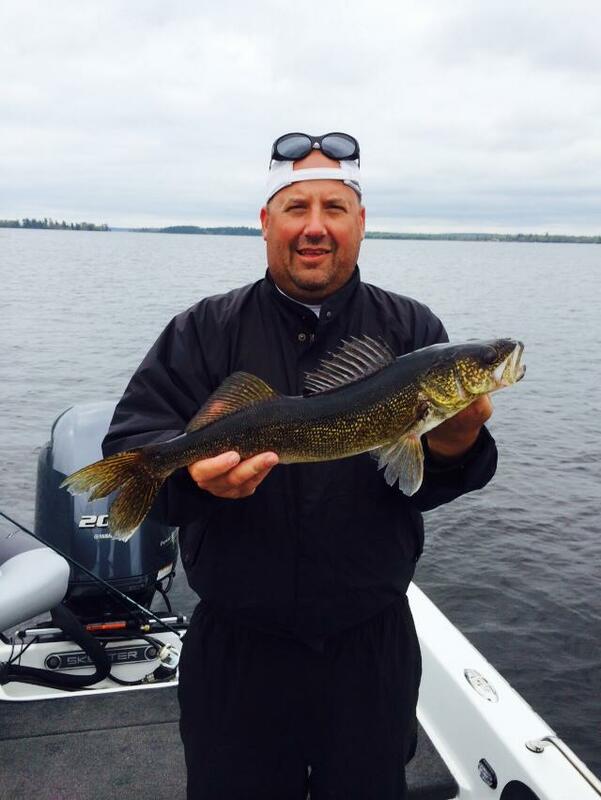 Nice walleye’s and a good pike caught by Todd who is the son of the owners of Ash Riviera Resort and RV Park. 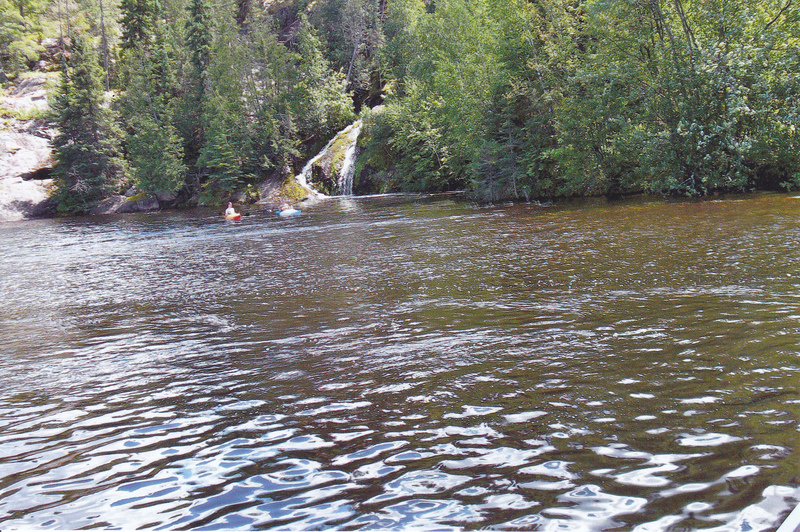 This is normally a small falls during the summer months on the Ash River. With the spring and early summer rains we had this year it turned out to be a spectacular sight to see coming into the Ash River . You know how hard it is to judge which lake is your very favorite. I have a few which are, but Grindstone is right up there. 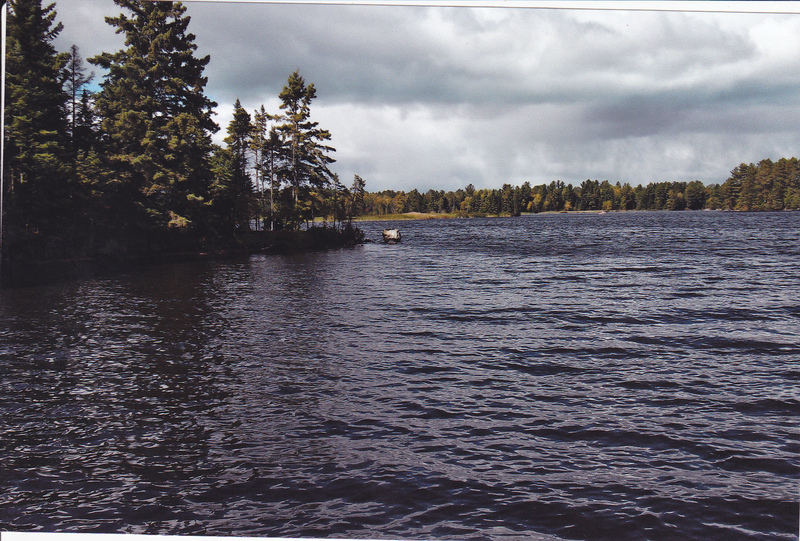 Grindstone is located in Pine County 6 miles west of Sandstone Minn. It’s one of the deepest lake basins in Minnesota and is an anomaly in a region dominated by 6 to 12 deep lakes. The lake basin was formed by glacial erosion which removed sedimentary material that had been deposited in the pre-glacial bedrock valley. 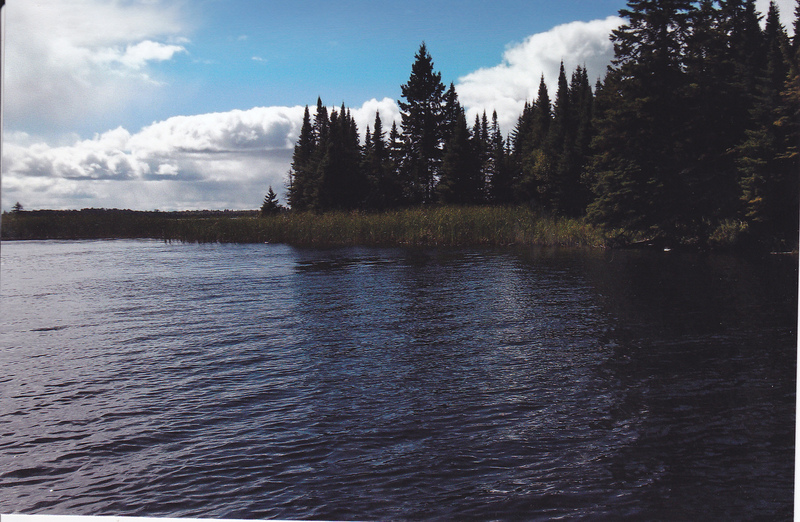 The lake is long and narrow, about a half mile wide, 2 miles long, and very deep. The deepest spot is about 153 feet deep. Grindstone is a two story lake so to speak. Meaning it contains habitat for both warm and cold water fish. The lake originally only had only warm water fish but has been stocked and maintained as a trout fishery. 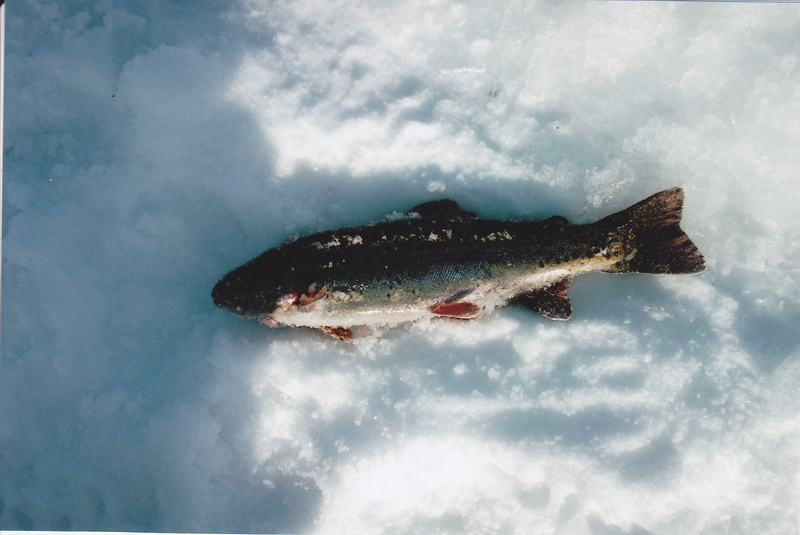 The trout are able to live in the deep, cold regions of the lake because oxygen conditions persist down to deep levels of the lake even in the summer months. 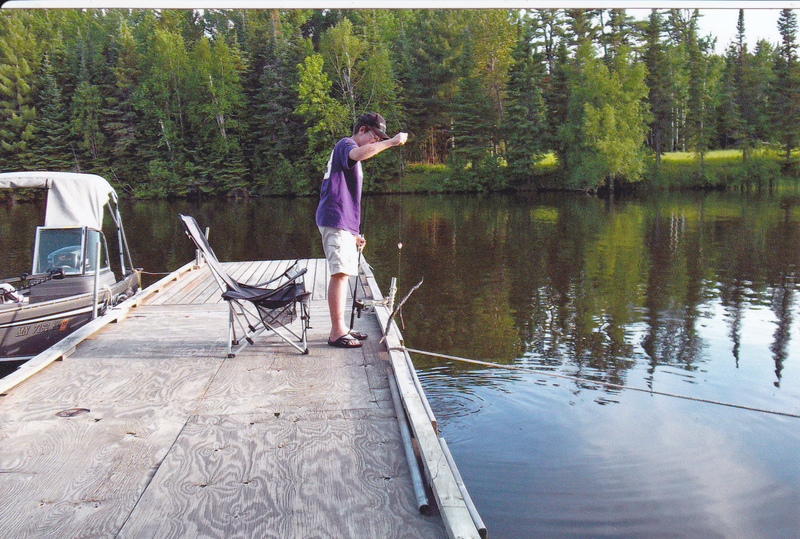 The lake gets stocked by the DNR twice with rainbow trout, once with brown trout and lake trout annually. Ice fishing for trout is gaining popularity so the DNR now stocks the rainbows twice a year instead of once a year in prior years. 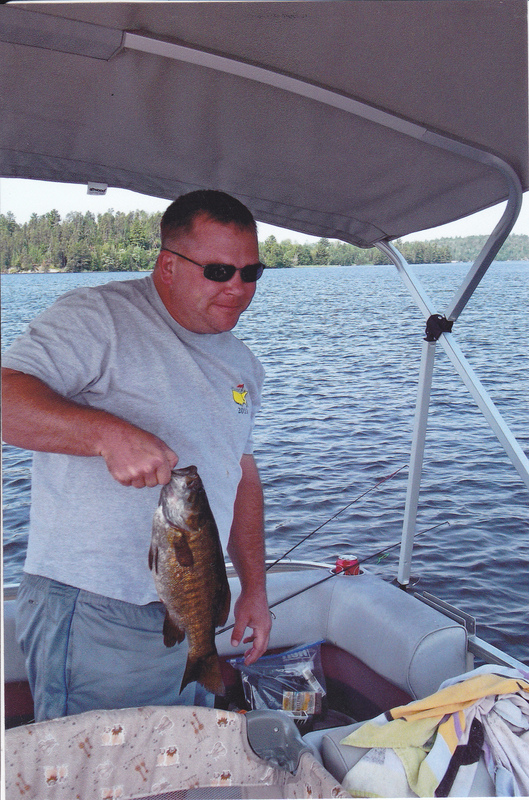 The lake also has warm water species such as northern pike, smallmouth bass, largemouth bass, crappies and other panfish. 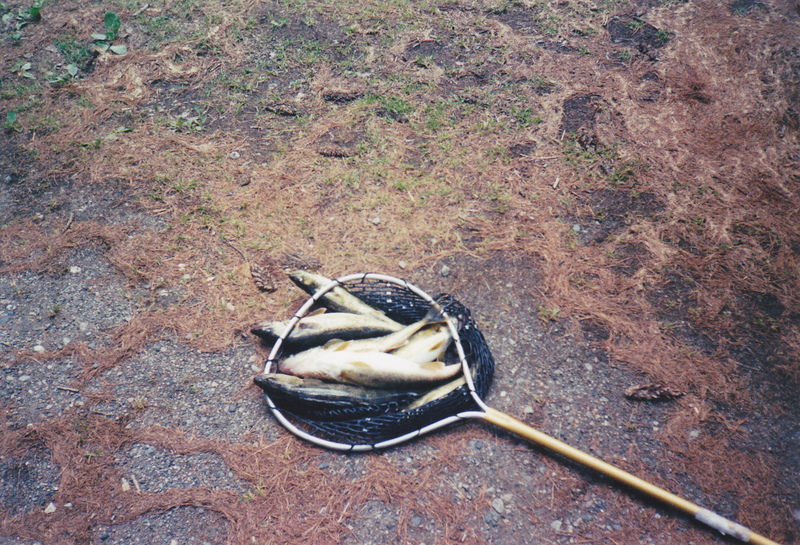 There are also smelt in the lake which provide forage for predators. 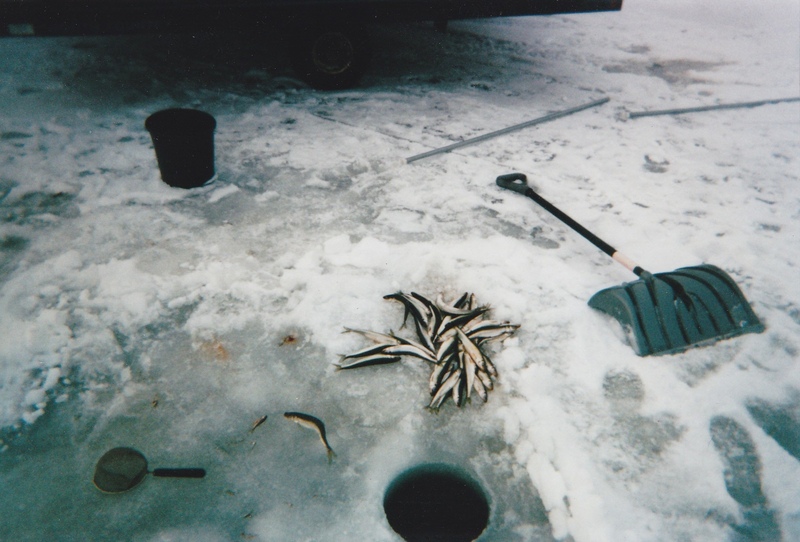 I also fish for smelt during the ice season. The boat landing is very shallow at times. It has a concrete landing with a dock. Early in the season from May through early July larger boats such as my 1850 Chrestliner can launch there. However after that, it can be difficult to put a larger boat in due to low water conditions from the lack of rain during summer months. There are exceptions but that’s the norm. I have used my 12 foot aluminum boat and my canoe during low water times and have had no problems. There is ample parking at the landing which is all gravel. There is a porta-potty at the landing during the fishing season. Please take your garbage home and keep the landing and the lake clean. Check your boat for weeds and pull your drain plug when leaving. In open water for rainbows and browns in the months of May and June I have had my best luck trolling with silver or gold/copper spoons. The rainbows and browns will be near the surface so no downrigger is needed. 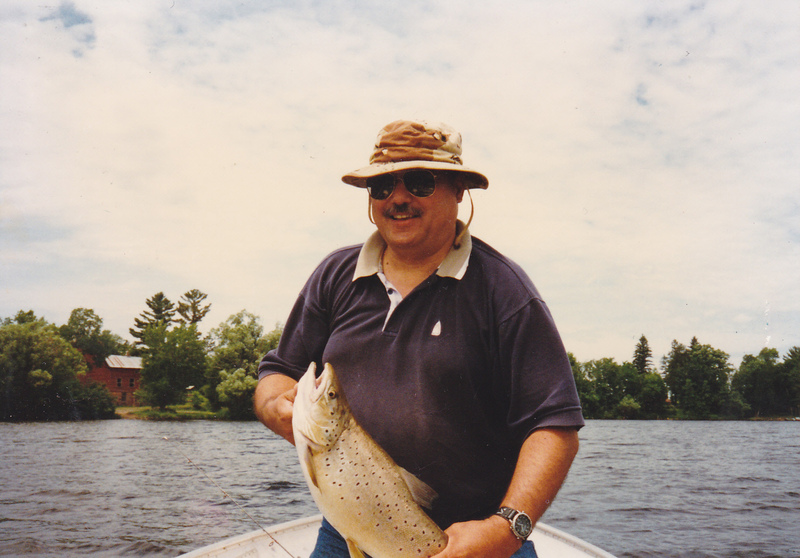 I have also caught trout near the shorelines with minnows under a slip bobber. Live bait is legal in Grindstone since it is not a designated trout lake. Small rapalas also work trolling for these trout. 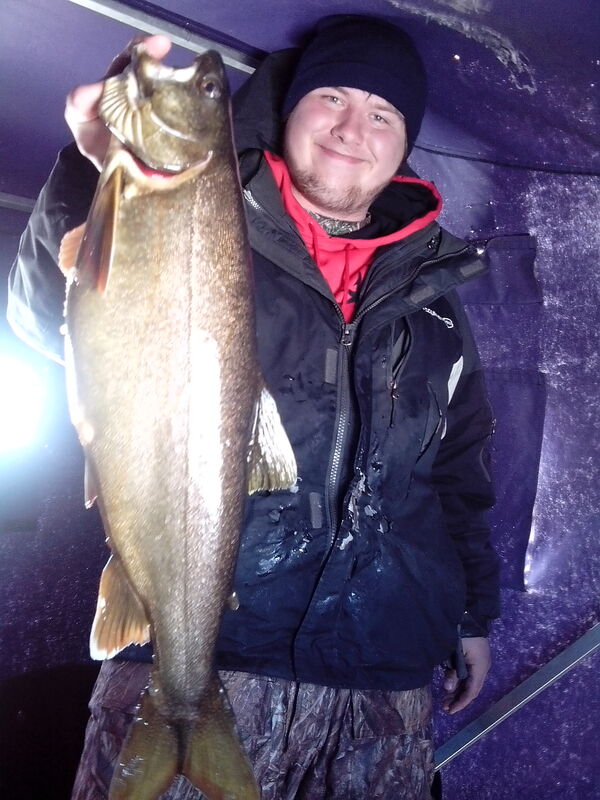 Lake trout on open water can also be caught trolling on the lake with spoons and crankbaits. They tend to run deeper than the rainbows and the browns following the smelt. 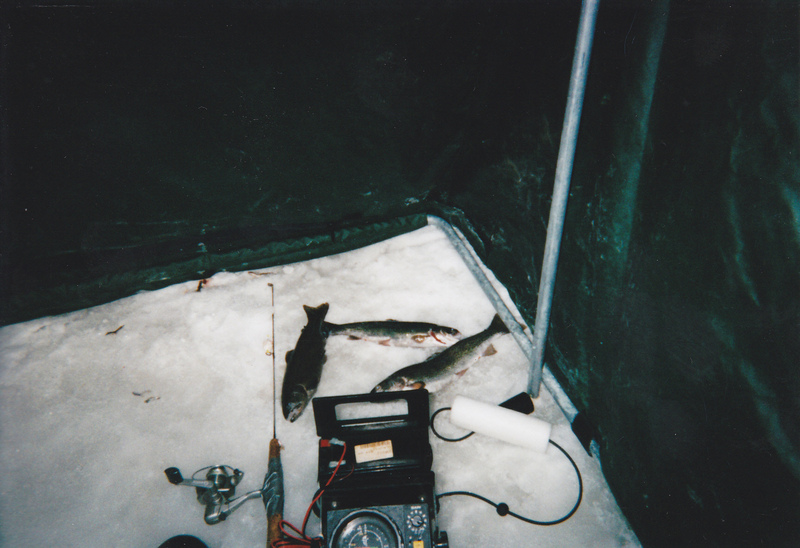 Biggest tip I can give anyone for lakers is follow the schools of smelt and you will be into the lake trout. 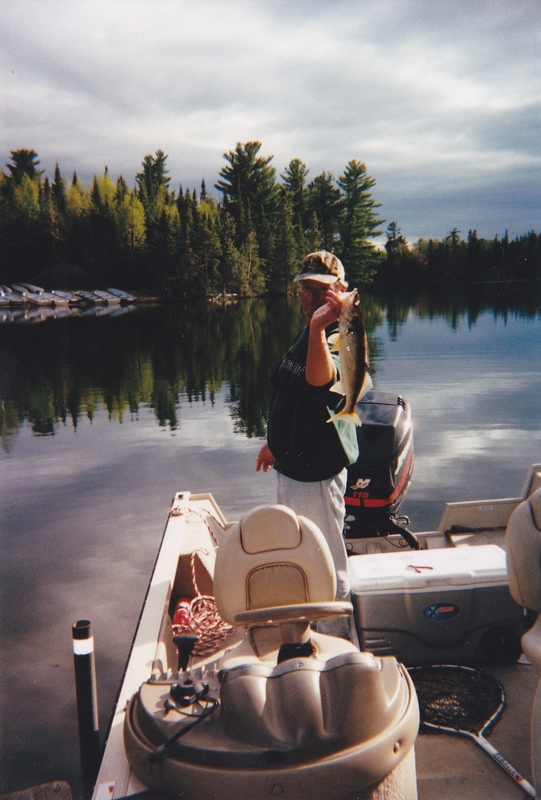 Vertical jigging can also work on open water. Jigging spoons, white tube jigs, and bucktail jigs tipped with a chunk of sucker meat works well. Work off the points and off shore humps. 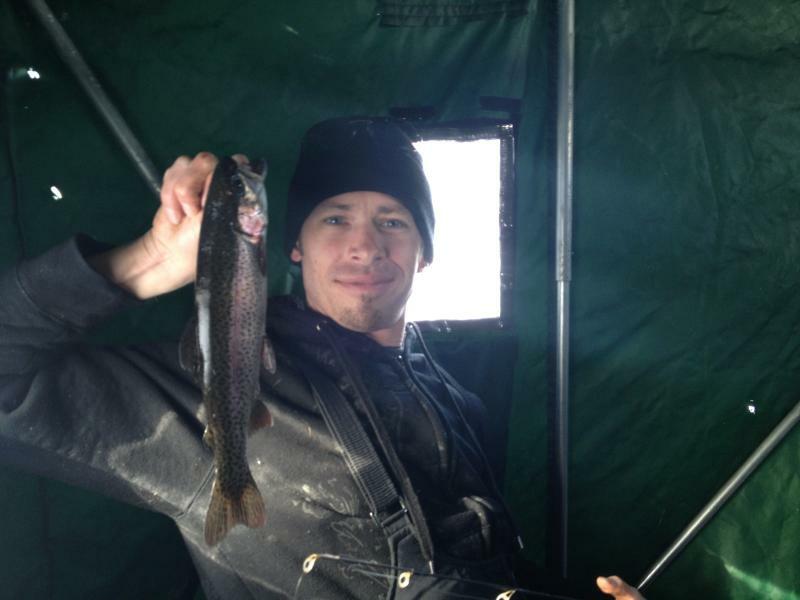 Ice fishing for rainbows and browns is getting more popular state wide, and Grindstone is no exception. Look for the rainbows and browns in shallow water during this period. I fish in less than 10 feet of water most of the time. Many times you can see the trout coming by your hole and even pound your presentation in the clear water. 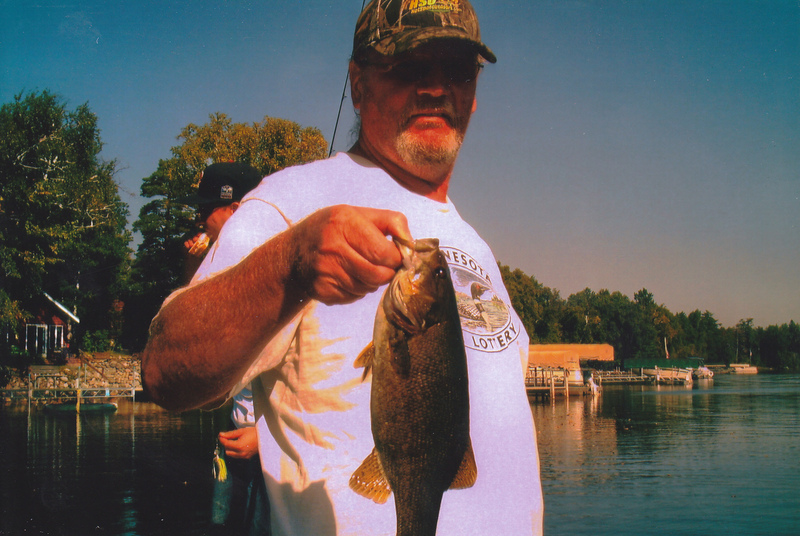 Use minnows under a bobber when fishing is slow. I usualy start with a small jigging spoon tipped with a minnow head. I jig it half way to the bottom. 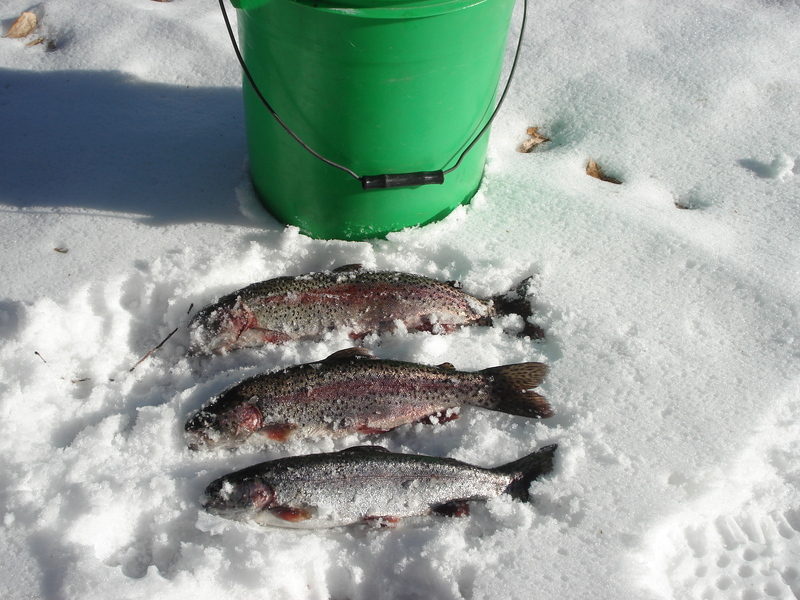 Trout like rainbow like swimming just under the ice or a few feet under. 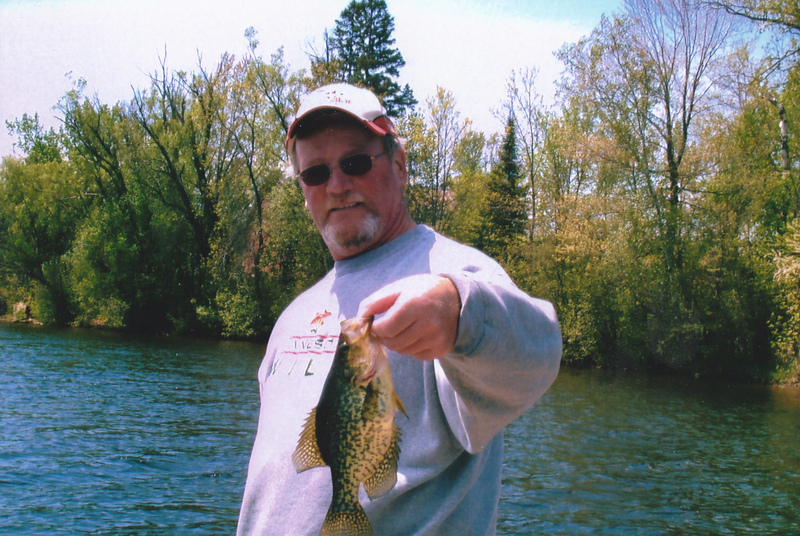 Panfish jigs can also be used tipped with minnow heads, eurolarva, or waxie’s. 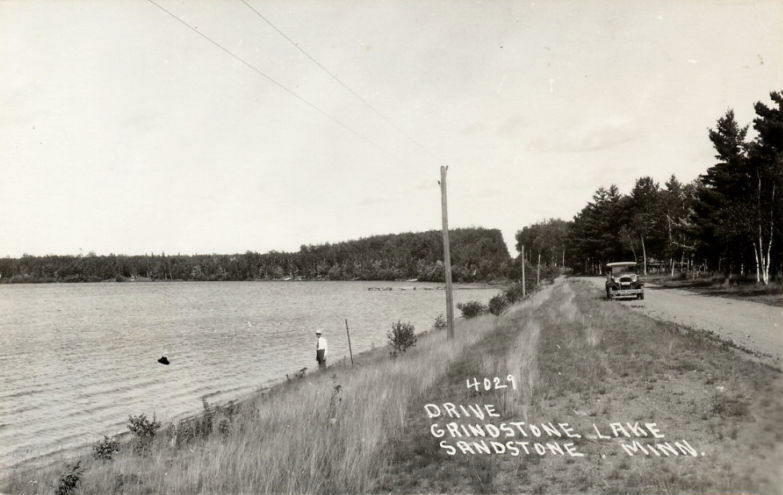 Here is an old pic of Grindstone from back in the 1920’s. This is the south side. The bottom of the pic would be where the bible camp is today and their beach. Notice how flat the land is there by the road. Today it’s much steeper. This is another pic of the south side where the bible camp is today. By the bend there this side of the point is where the Grindstone River leaves the lake. 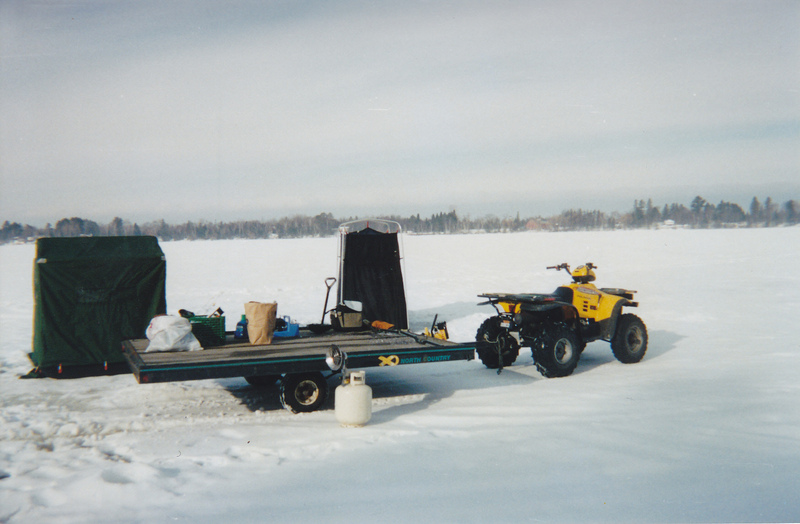 Fishing the East side of the lake during hard water season. A few rainbows bite the dust on my way to a 5 trout limit. I do not get a limit all the time and sometimes get skunked but I love being there. 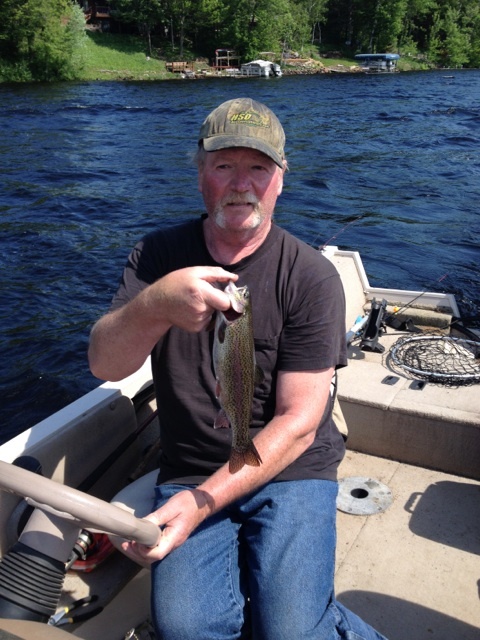 Here are three nice rainbows caught by my friend Jim. They are 12 to 15 inches long. Tony with a nice rainbow. 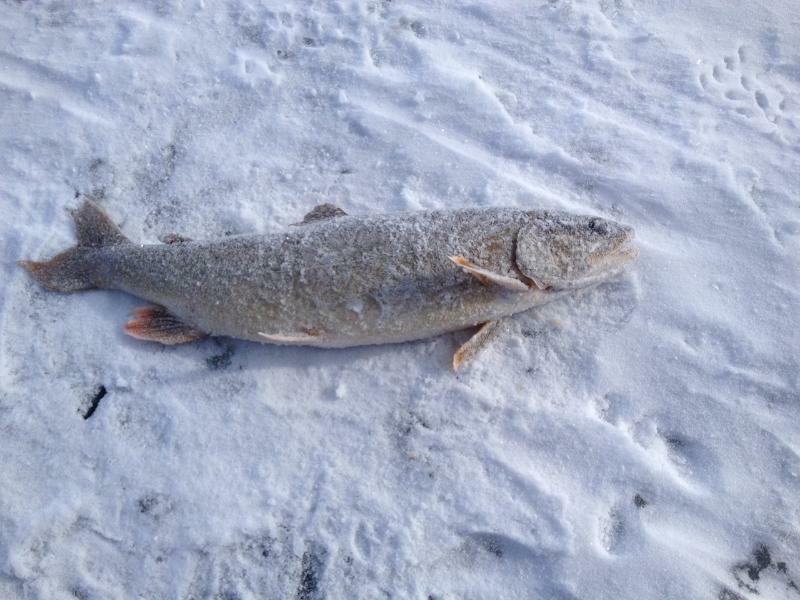 Nice 4 pound lake trout caught in 5 feet of water. Not the normal depth I usually catch lake trout. However I caught these fishing shallow for rainbows, and a few lake trout came by. We could see them swim by this day. Really don’t see that much at all, but it sure was fun. My brother on the right with his friend Emanual holding a nice 6 pound brown trout he caught vertical jigging in deeper water with jig and minnow. In the background you can see the landing before having a dock. There are nice smallmouth to be had here. This one was taken on a spinnerbait. Another nice smallmouth taken the same day. Have some fun and take a break from trolling and just work the shorelines and you will get into bass and pike. 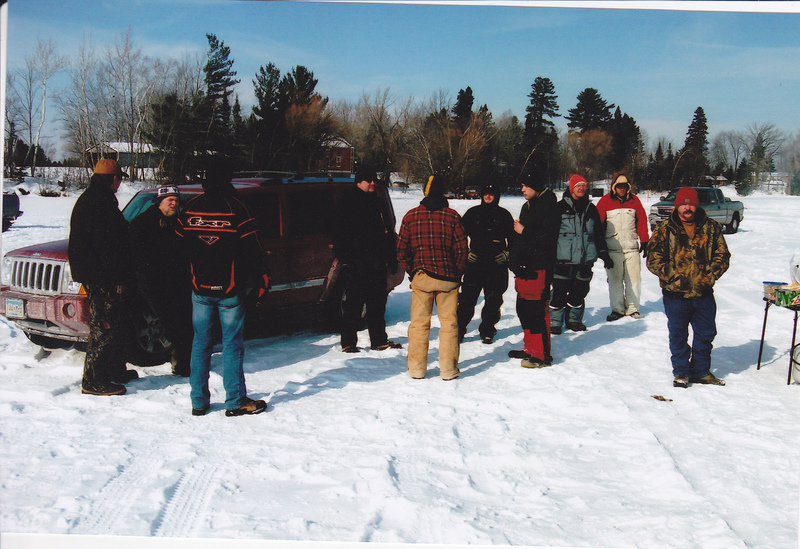 Fishermen line up on the shorelines during hard water for trout. I put on a Grindstone get-to-gether every winter during late January or early February depending on the safe ice conditions. Here are some of my venison chilli franks and old fashion franks simmering for the guy’s. My German kraut with bacon is hot and ready to top the franks for a tasty meal. Lot’s of food was brought by the guy’s attending the GTG. 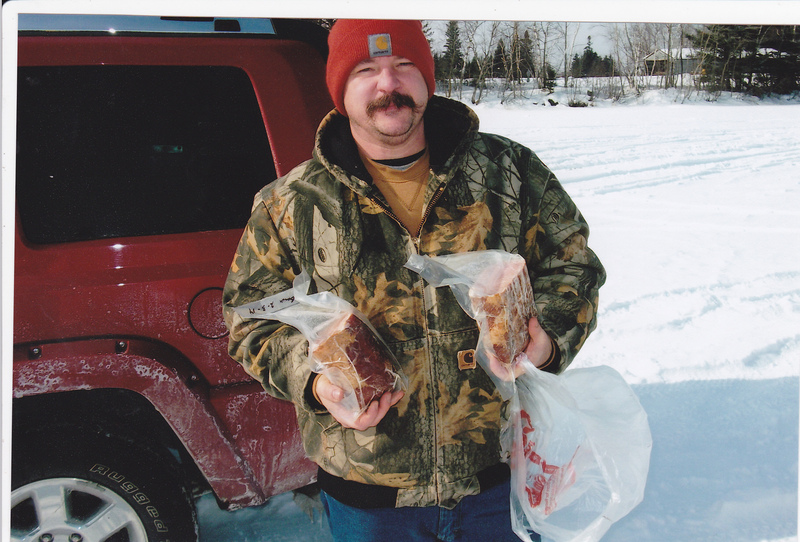 The bottom photo is of one of the winners of Canadian bacon I smoked given away by drawing numbers. We all had fun and fish were caught including this rainbow. Cant stretch my arm out far enough to make this crappie look like the average ones we get out of the Grind. On average I do catch them between 10 and 11 in. I do have two mounted that go 15 inches. This is more like it from the Grind. 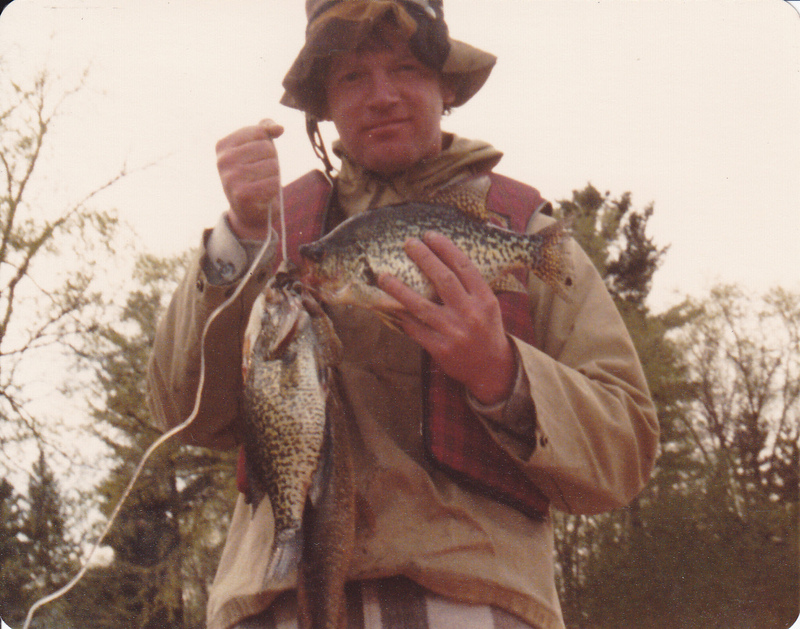 Here is an old photo of me in the 70’s with a big crappie from the Grind. This was a good catch of smelt from Grindstone with some in the 10 inch range. Here is a picture of the Grindstone boat landing when the water is low. We had to use my friends 14 footer this day. My 1850 Chrestliner would not have made it this day. I use what I call “the tire gauge” for my boat on the landing. When the water level is less than half way up the tire [on the DNR dock], I can land my Chrestliner. A good level is half way up the cement ramp. As you can see, it’s not even close on this trip. My brothers friend Emanual with his 6 pound brown trout from Grindstone. Nice batch of crappies from Grindstone. Some bigger than the beer bottle. Some nice rainbows ready to be freezer wrapped for a future meal. Here is the landing at Grindstone when the water level is good for my Chrestliner. The water level is more than half way up the dock tire. My “tire gauge”. Nice brown trout out of the Grind. Caught it on a tip-up with a shiner in 11 feet of water. This is what high water at the landing looks like. This pic was taken June 5, 2014. The current of the stream entering the lake was flowing well. Here is a nice rainbow caught trolling with a small bronze spoon near the surface. 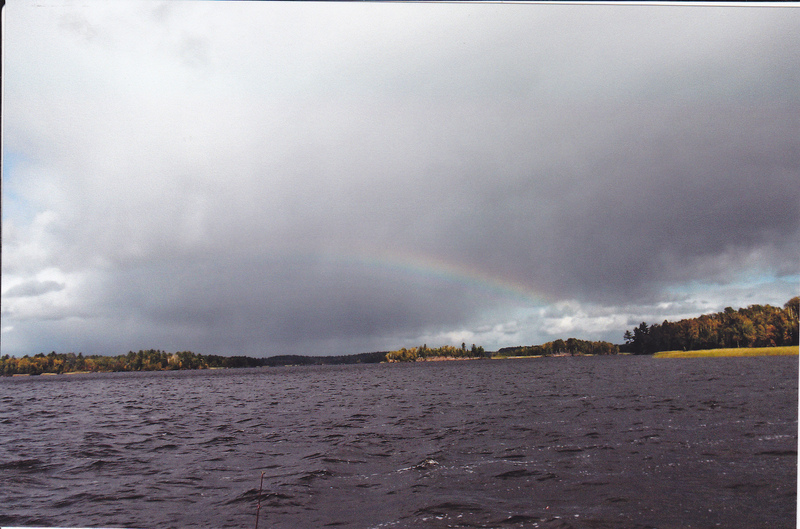 This rainbow was probably on it’s second year in the lake after stocking . There is good carry over in this lake which makes rainbows like this plenty tasty. 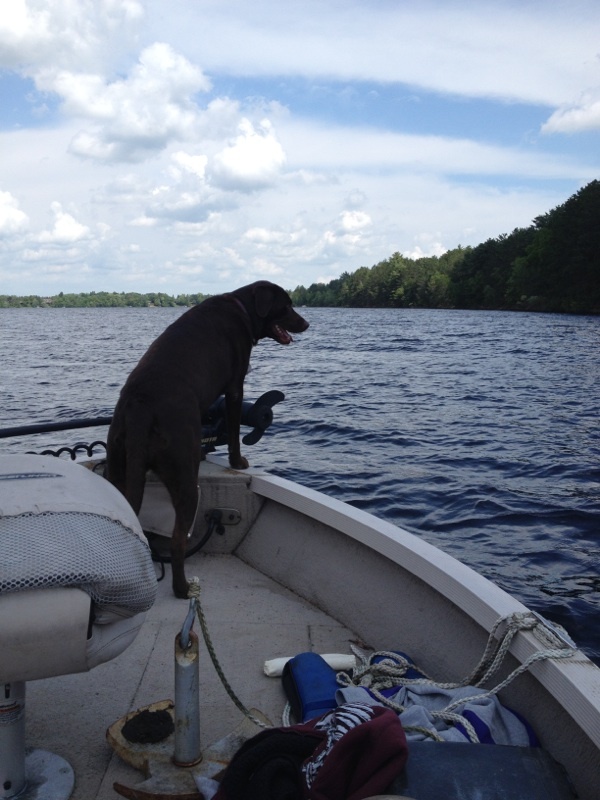 My chocolate lab Lucy, loved being out for the day as well. The day got cut short with high winds developing and a storm moving in. A nice 12 inch crappie from the Grind. This big girl was pushing 15 inches. Put her back in. She was still full of eggs. Things look good for crappies in this lake for the future. 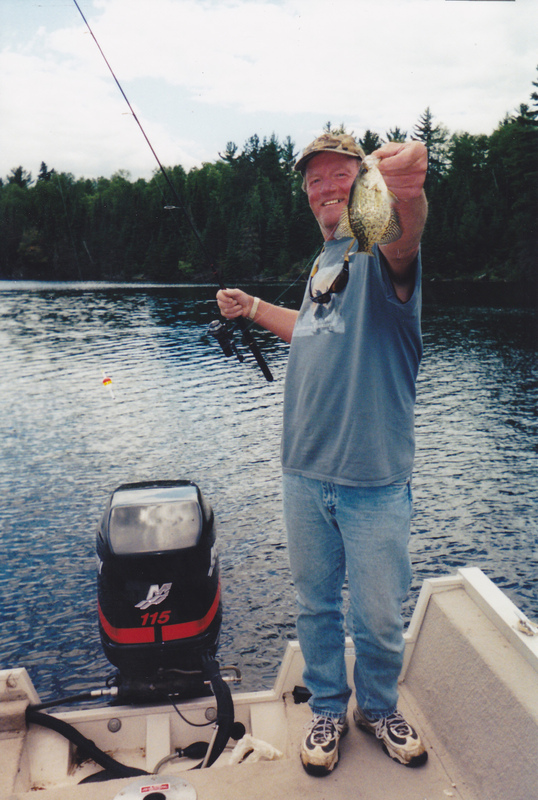 Caught many small ones this day as well as well as observing schools of small crappies near the boat. 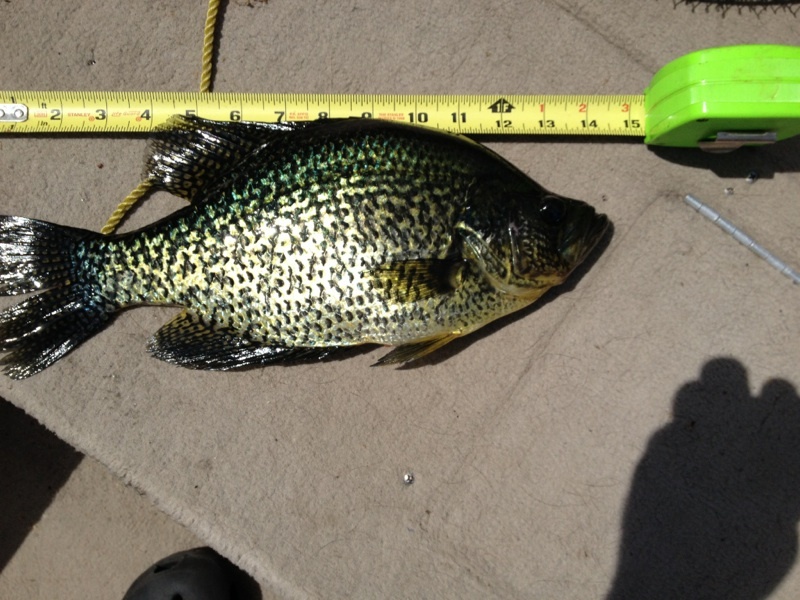 Another nice crappie that went 15 inches. 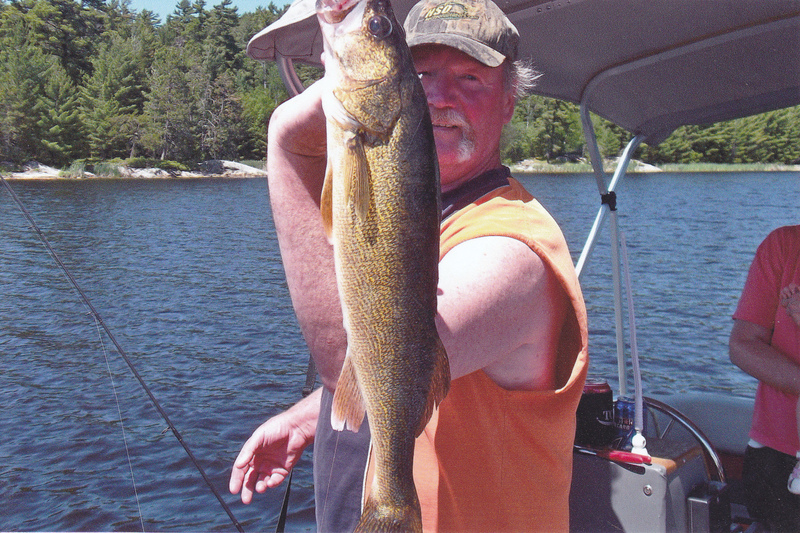 Marshal caught this nice laker last year on Grindstone . Caught it suspended in 50 feet of water 35 feet down. There are some very nice lake trout in this lake. 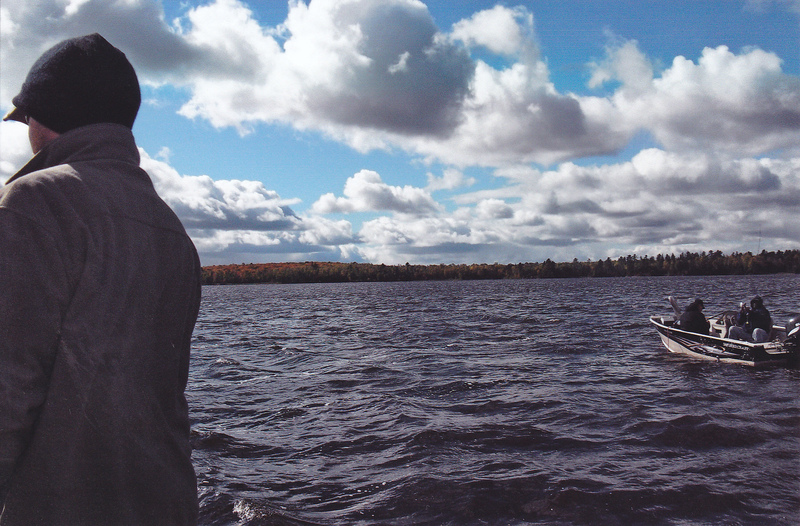 I have fished Boulder since I was a kid living in Duluth. Lot’s of things to say about this lake. I can talk about the fishing [which i will] but it’s more than fishing. 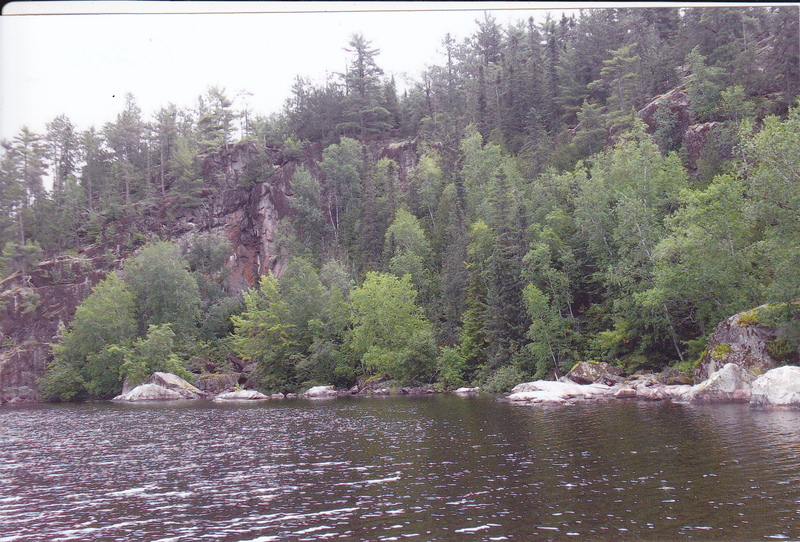 This is one lake that has the feeling that your in Canada and yet it’s near a city [Duluth]. It has two side’s realy, the Otter side and the Boulder side as many call it. 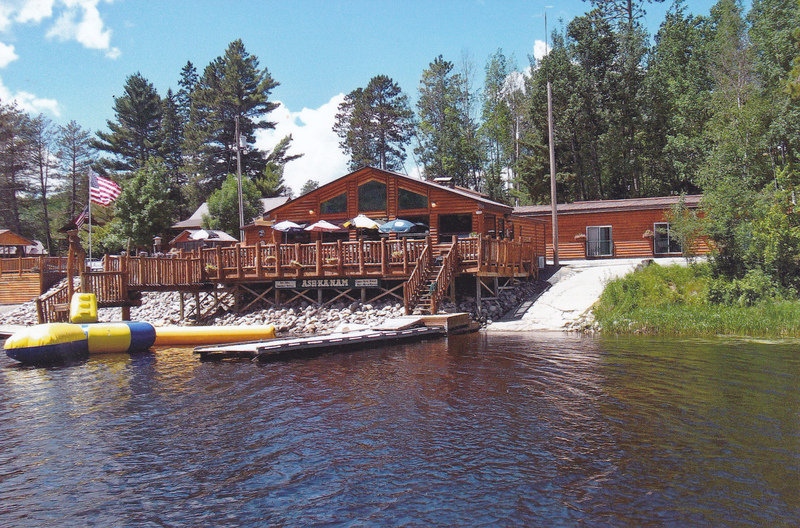 The Boulder site has all the cabins and one resort [Silver Fox Resort], while the Otter side has the islands and it’s many bays, and also has the public boat landing. The boat landing has a cement ramp and a loading dock. Large area for parking as well. You can fish from shore from the boat landing also with the dam nearby. 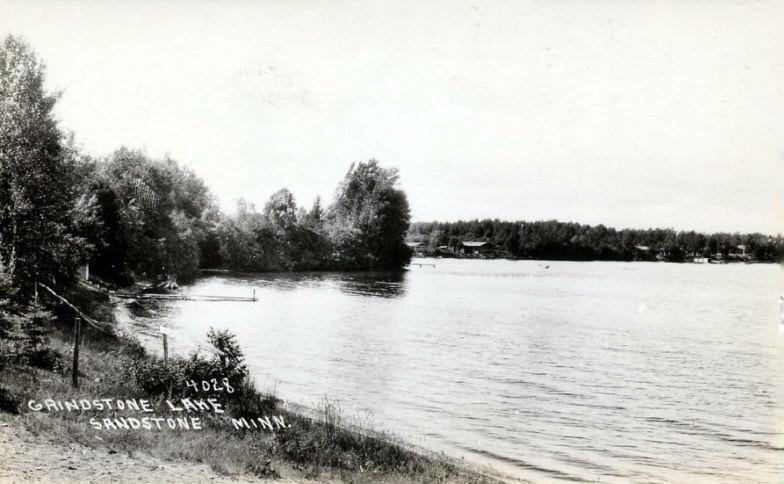 Boulder Lake was created when Minnesota Power dammed the Cloquet River system in the early 1920’s. This reservoir covers 3, 882 acres. Has a max depth of 18 feet with 85% of the reservoir being shallower than 15 feet. This is also a place where running your motor on your boat full speed is something to be considered or better yet , not even done. This is prop shop heaven with all the boulders and hidden wood objects would surely do damage to your lower unit if not carefull. I know the lake very well, and yet there are only a few spots I feel comfortable opening up the motor to get to point B from point A. Yet these hazards to your boat are structure for the fish. 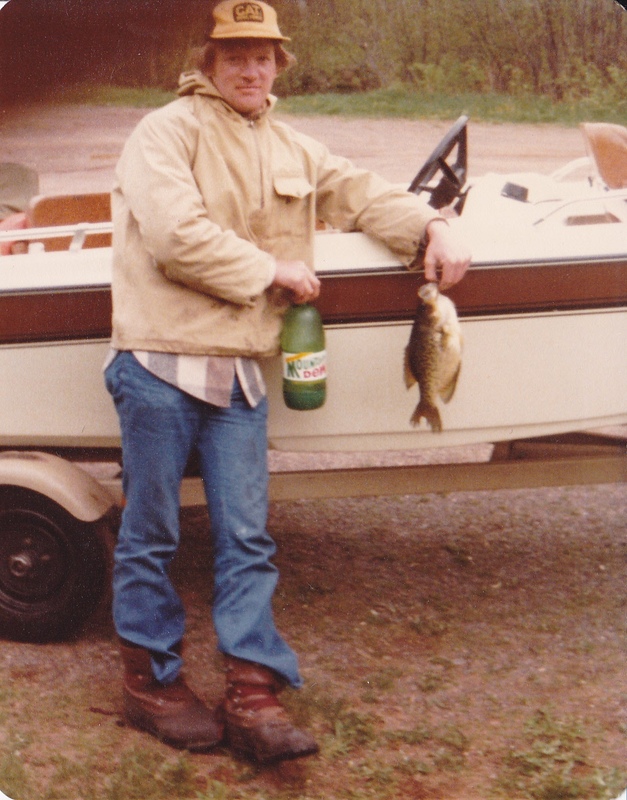 I’ve fished the lake since the 60’s and the fishing realy hasn’t changed much over the years. Sure there are times better than others but that’s the case in most lakes. There was a problem with bullheads years ago but opening the lake up to commercial fishing for them helped the numbers to decline to a level that are acceptable to the DNR. I have to say that I have not had a problem with them at all in recent years. 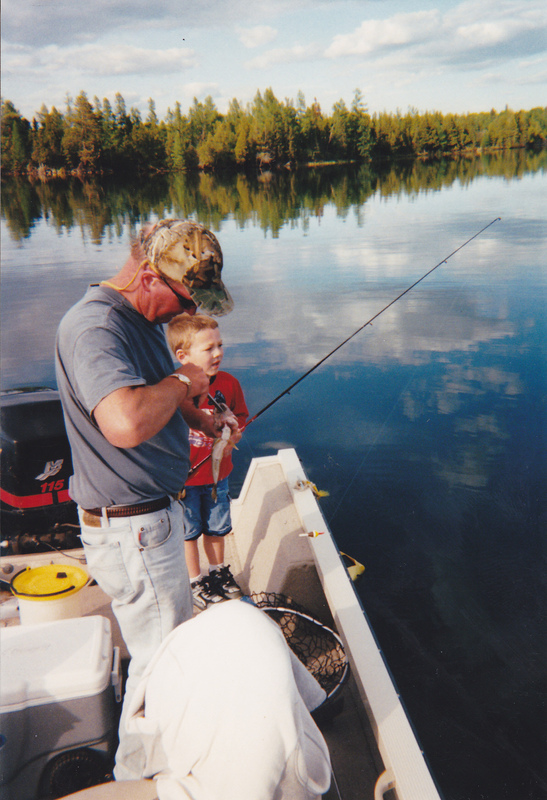 Years ago they would take a minnow or a leech but I haven’t caught one in a long time, so those days are gone. 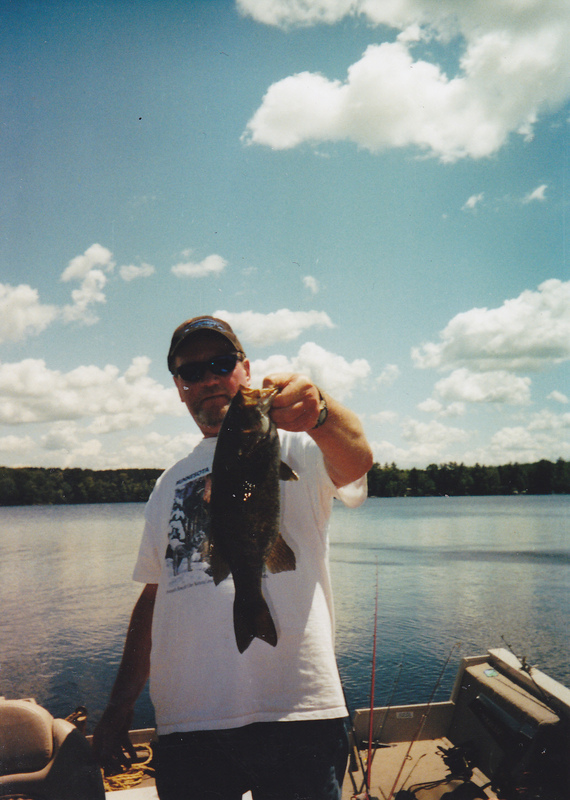 I probably have caught 6 or seven walley’s over 6 pounds over the years there but most I have caught have been between the one and 3 pound range with somewhere in the middle being the normal. On open water I dont fish deeper than 8 feet. The water is stained so with a walleye chop the day bite is good. Never had much luck at night. Trolling with crawler harness is one way to get to the eye’s. Floating rapala’s is another with a split shot about 18 inches in front is another. However a minnow or leech under a slip bobber is by far the best way to go in my opinion with leeches from June to Sept and minnows from May to June and also from September through the hard water season. Boulder Lake also has the Boulder Lake Environmental Learning Center located on the south end of the Boulder side. Many events are scheduled at the center and camping on reserved spots on the lake is available to the public. Call 218-721-3731 for all the details. One of my favorite pic’s of Boulders Otter side. 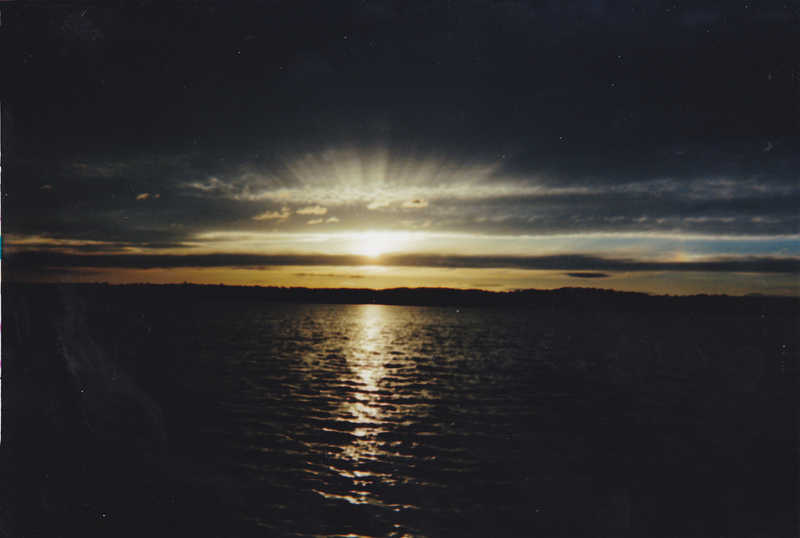 I took this picture from an island I camped on. The tall pine often has a bald eagle on it. Good walleye chop here in 8 feet of water. 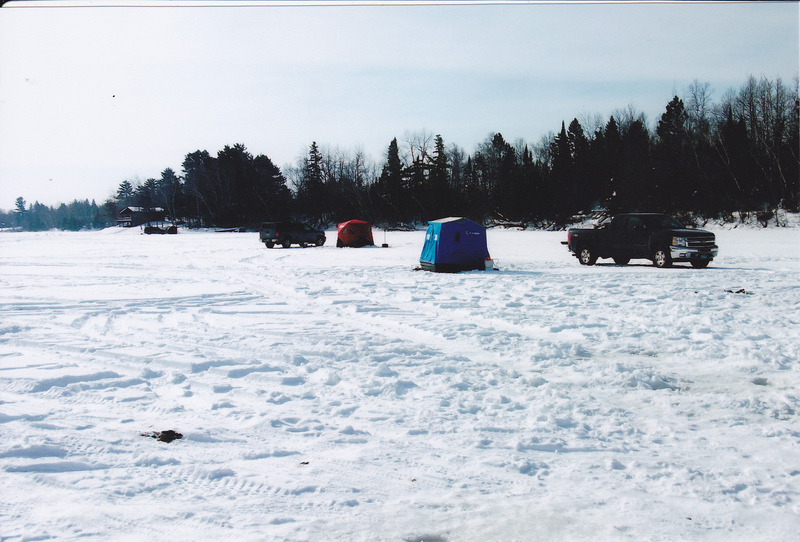 We anchored here and caught crappies near the boats and walleye’s closer to shore this day in 4 feet of water. We used minnows under a slip bobber on the fall day. Snow and sleet systems came through on this windy day in between sunshine. This is one of the spots I fish on Boulder. It’s about 5 feet deep here with the breeze entering this pocket between islands. The water is bog stained so daytime fishing is productive. Shorelines and points such as this one off an island are good spots to check out. No use jigging here on this lake with all the snags on the bottom. You can use a plain jig and minnow or leech under a bobber a foot off the bottom. We used to be able to camp on this island but it was shut down do to folks leaving garbage on the island. If you do go on a island to camp on, please take what you brought with you back with you. Boulder needs to be kept in it’s natural state at all times. Good example of a great place to fish on Boulder. 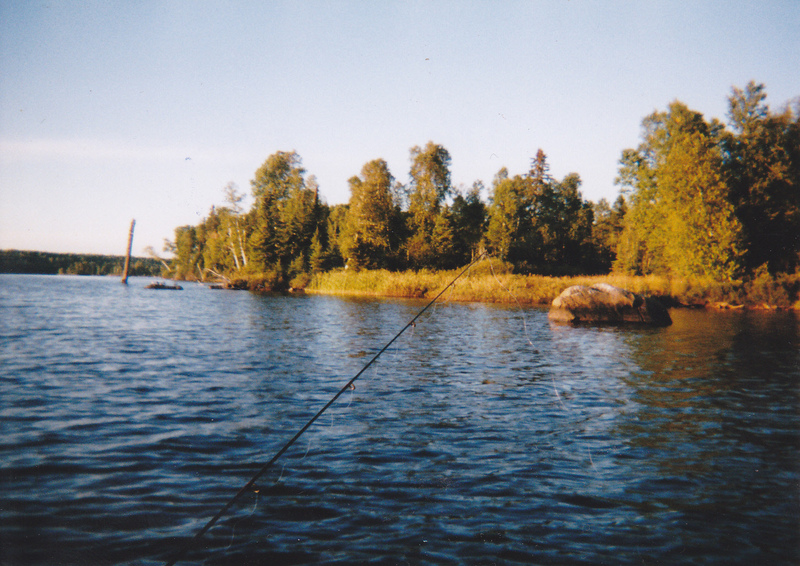 I once caught and released an 8 pound walleye by the large boulder on the right side. It was May and I had my minnow drift right to the rock when the big girl hit. 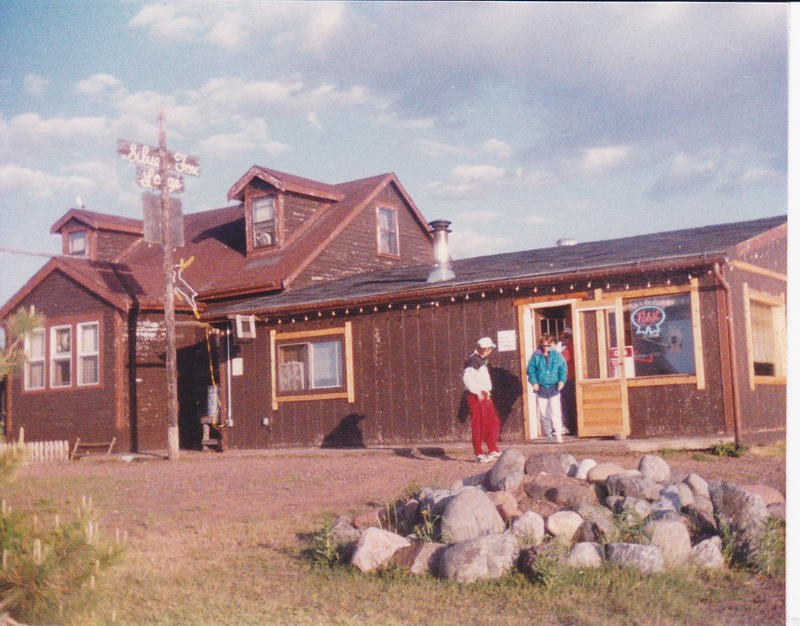 This is the Silver Fox Resort on Boulder. They have a campground and cabins for rent. Small fee to launch your boat. Many years ago there was also a Nordbergs Resort on the lake but it is now the Environmental Learning Center I spoke of earlier. Got a tent or camper and love camping? Bear Head is the place to go for a fun stay for the whole family. It is a State Park so a fee is required to enter the park or to launch a boat there. I’ts a good idea to reserve a campsite if you want to stay there for a couple of days or a week or so. The park offers many things to do. You can camp, have a picnic,bike ride, watch wildlife [which is very popular] , swim at the beach, go fishing, or just plain relax. At the ranger station you can buy ice and wood for the campsite. 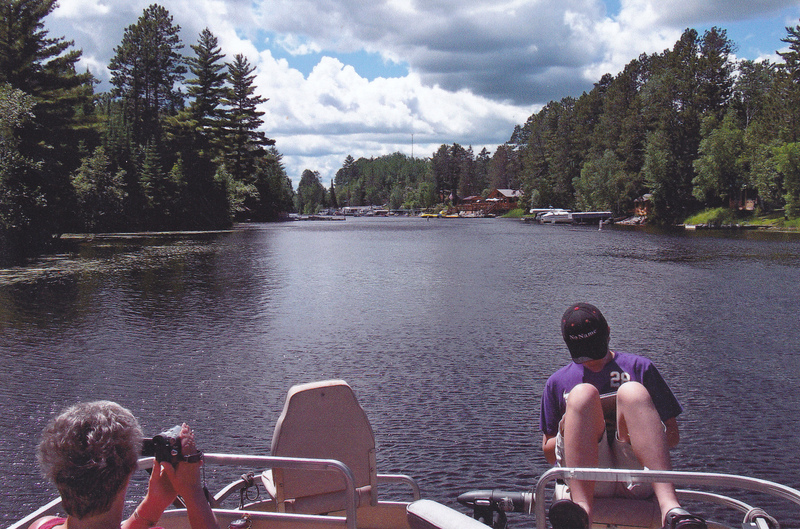 You can also rent a boat or canoe along with goes along with them [electric motors, paddles, oars, lifejackets, ect]. 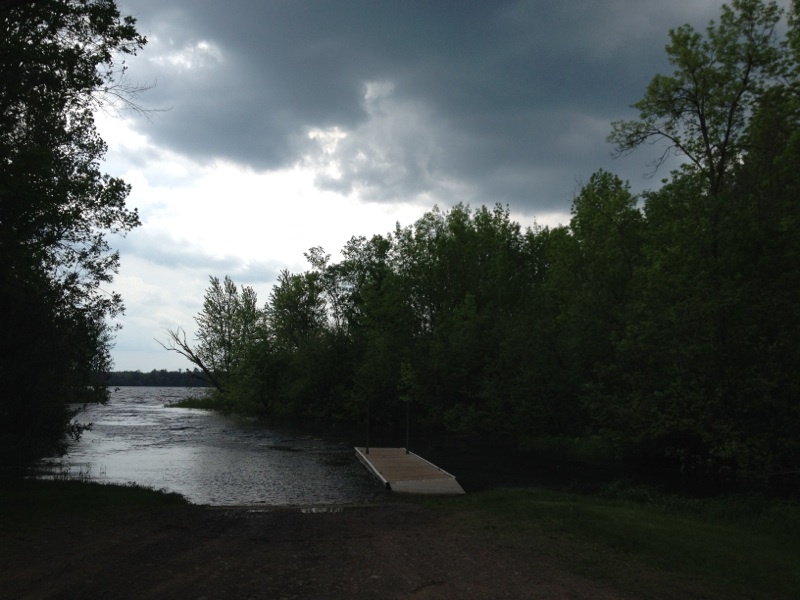 The campground has a very nice boat launch with a large parking area and a public fishing dock. 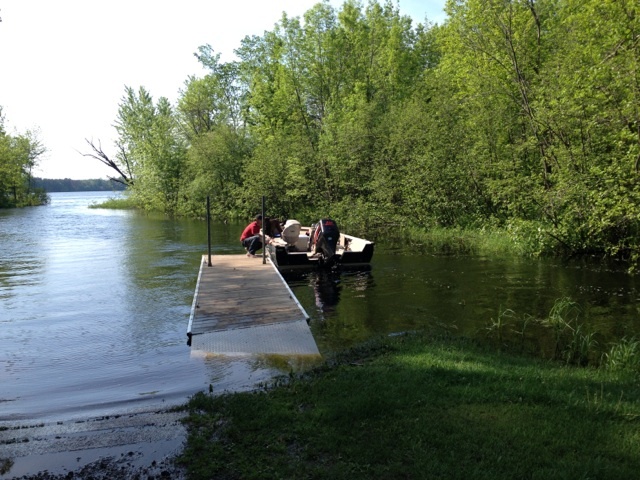 The boat landing has a cement ramp and can handle boats of all sizes. 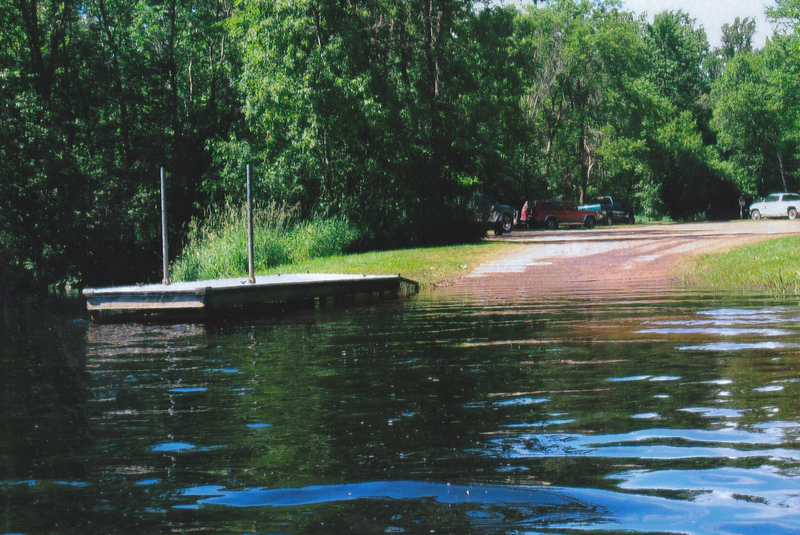 The campground also has some smaller docks to secure your boat on when not fishing. There are two areas for showers also. Very nice private showers with vanities and bathrooms. There are also restrooms scattered all over the campground. 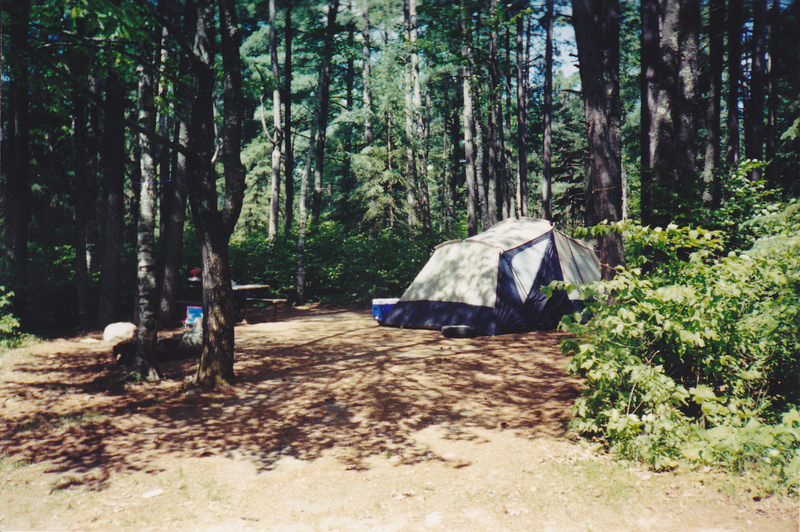 Basic and electric sites are available along with a group campground. You can even rent a house on the grounds along with some camper cabins. Water is always nearby for your cooking needs. There are hiking trails along with bike trails within the grounds. Bird watching is very popular here with the Eagle nests being the number one draw. The beach area is very kid friendly with a nice beach and a roped off safe area to splash around in. The fishing in the lake can be very good. 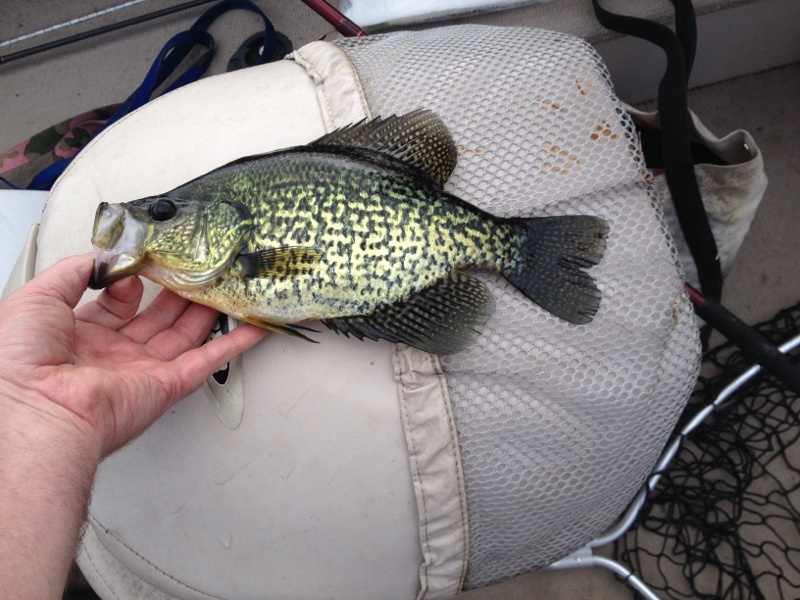 The kids will have fun with the many areas for panfish in the north arm of the lake. Largemouth bass lurk there as well with some very nice sized one’s caught. 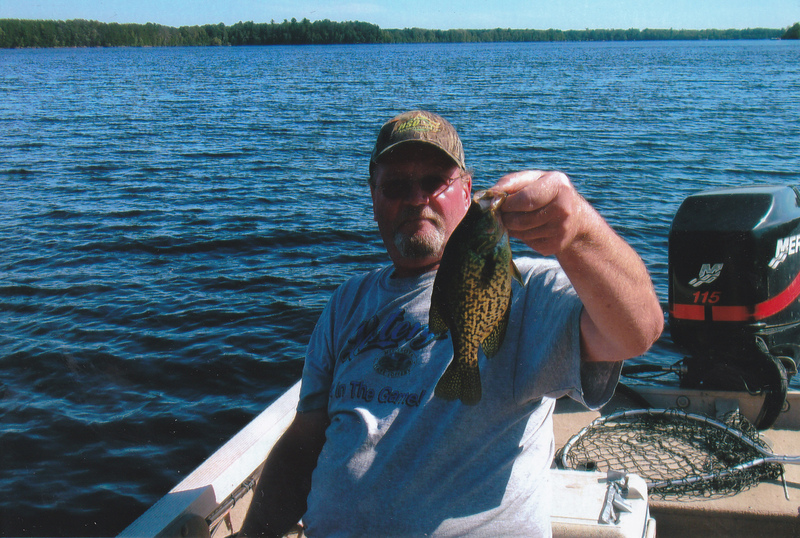 The north arm is very good for panfish early in the season but are in there all year. There is a 10 MPH speed limit on the lake so be courteous out there with the folks out on canoes and kayaks on the lake during the day. As good as the fishing can be at times, it seems that most folks that go here go to observe nature, wildlife, and everything that goes with it and don’t fish much. We go there to do the same, but we do fish, and fish a lot. 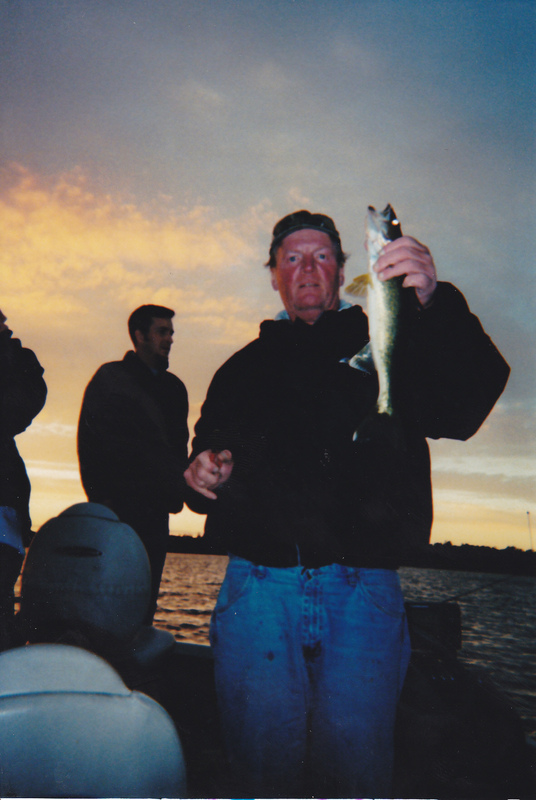 Walleye’s are the most sought after fish here along with the nice bluegills. 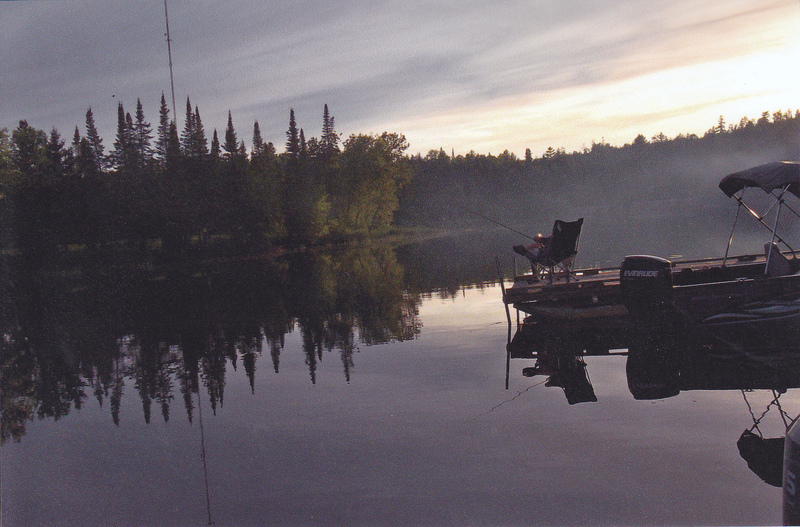 Walleye’s are caught here during the day, but early hours and late afternoon into evening is the best. The North/East part of the lake has more rocks and humps than the south end [the largest part of the lake]. Watch for the rocks as you cruise that area [northeast bay]. Walleye’s will be found around the rocky humps and near weedlines in that area. 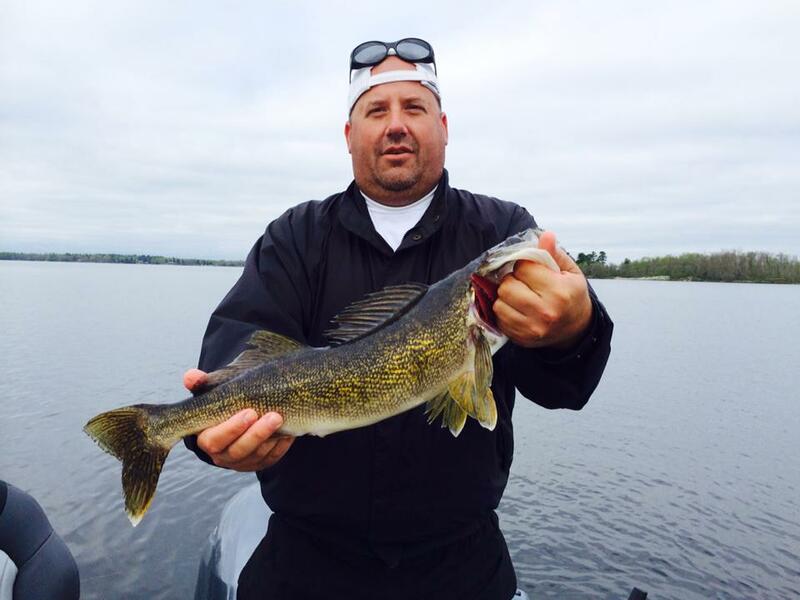 The south end has more pronounced weed lines which are the key to good walleye fishing. I fish the weedlines during the day and late afternoon. A leech under a bobber a couple of feet off the bottom work well for walleye’s on these weed lines. 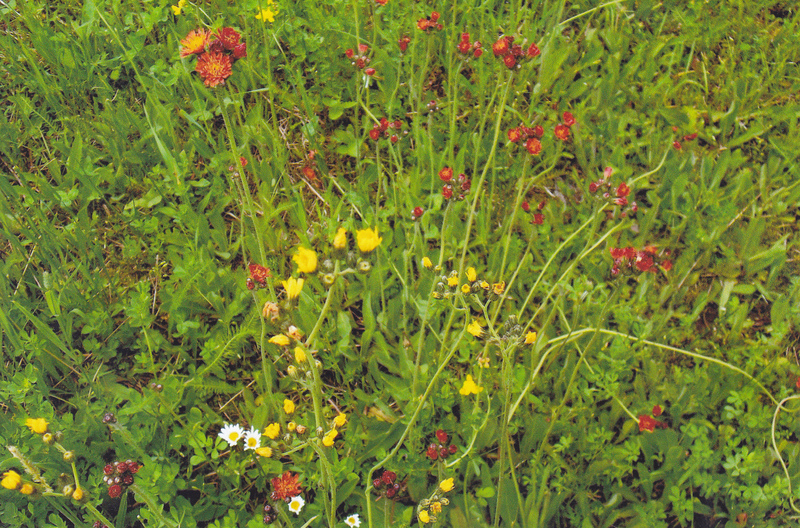 Deeper weedlines during the day and much shallower early and late in the day. A floating crawler or leech also works off points using a bottom bouncer or drifting with a Lindy rig on the south end’s sandy bottom. Trolling a crawler harness also works near the weed lines as well with a electric motor. Bass and Pike are found all over the lake. 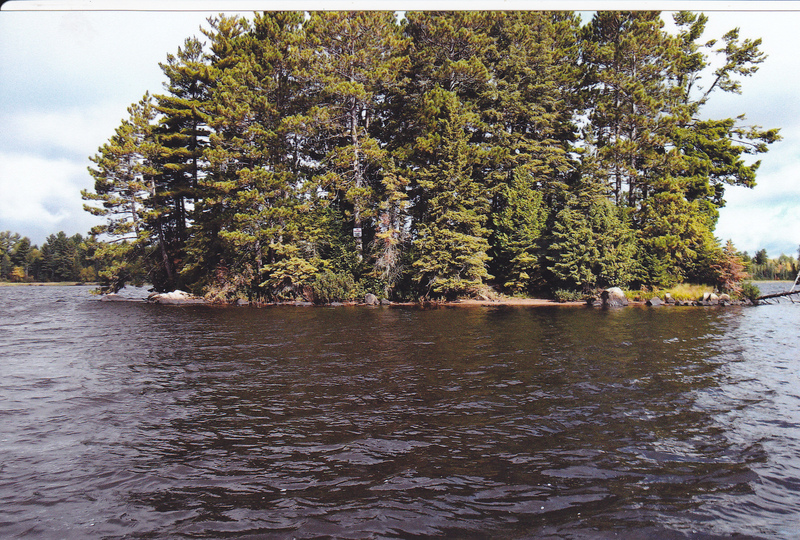 The lake has many overhanging trees and lumber from the logging days to provide cover for bass and weedlines and cabbage weeds to hold both bass and pike. There are also two stream trout lakes within the park. 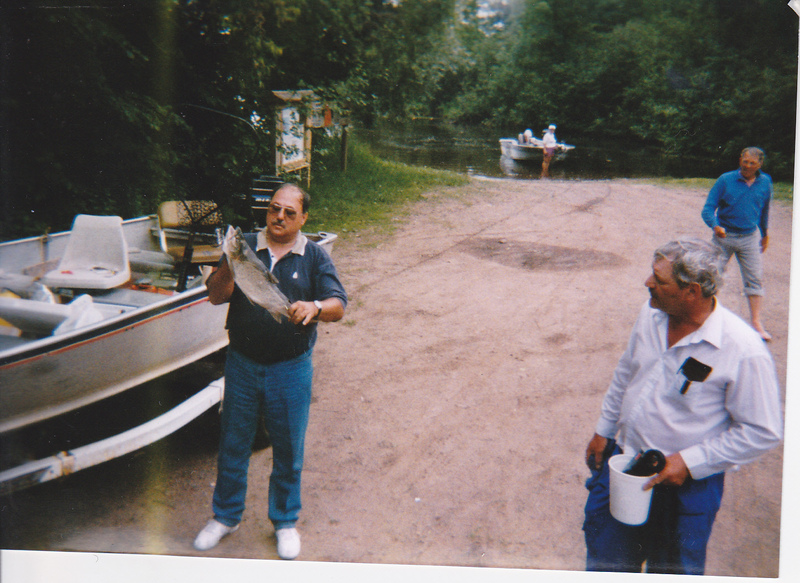 Both are stocked with brook trout. May and June are the best months for those who like going after trout. You need a trout stamp to fish these lakes. 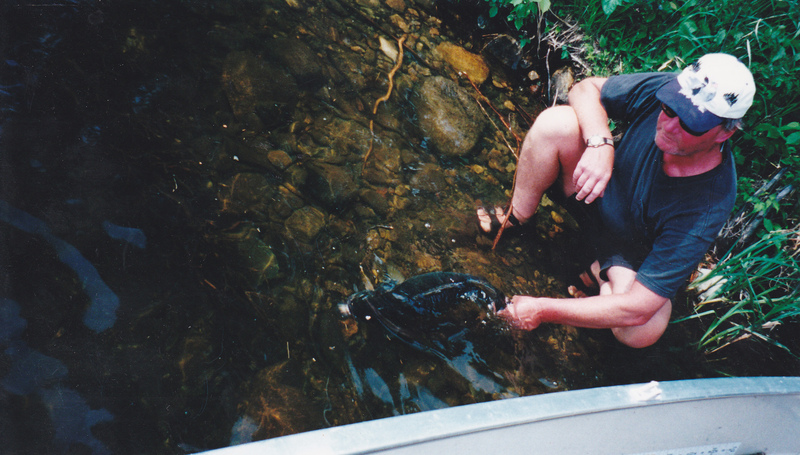 Methods to catch the trout are simple. Casting small spoons or spinners can have good results. Even using worms under a bobber works here. 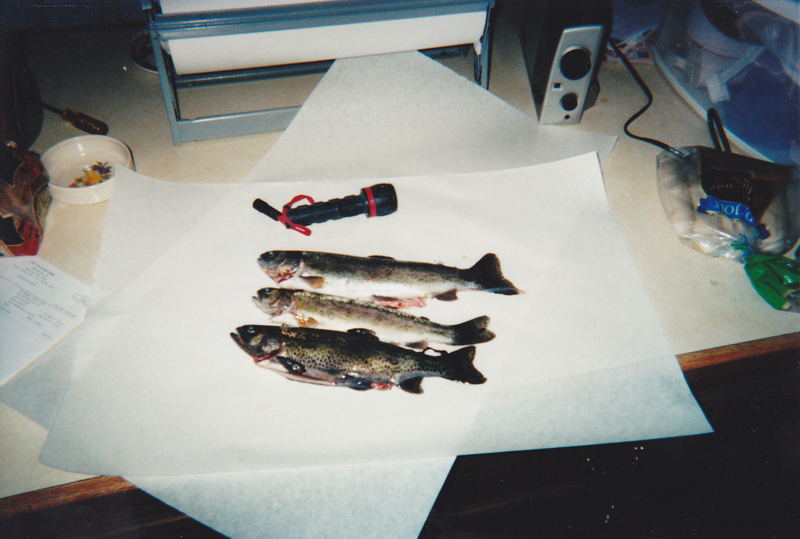 I also have used a nightcrawler injected with air with a slip sinker off bottom to catch these trout. So there are many things to do here with the family as you can see. Another benefit camping here is that you have the great towns of Ely and Tower nearby to get any grocery goods you may need during your stay. 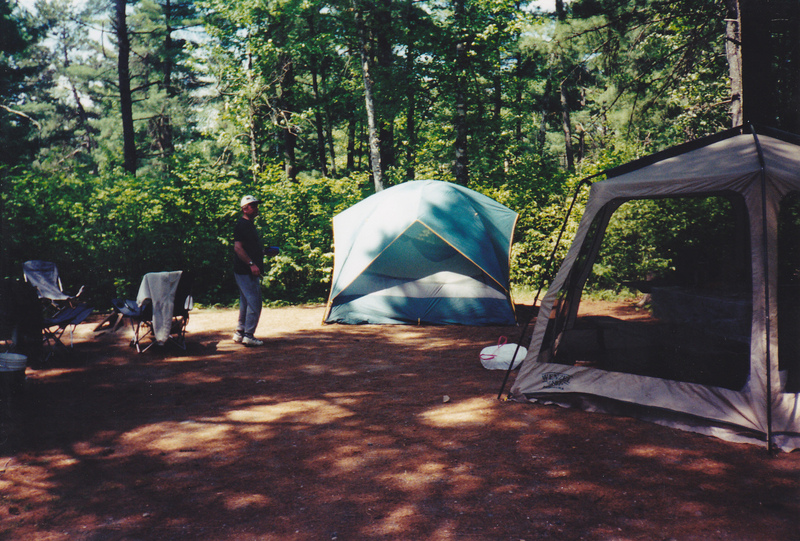 Here are some pictures I have of some of our stays at the campgrounds. 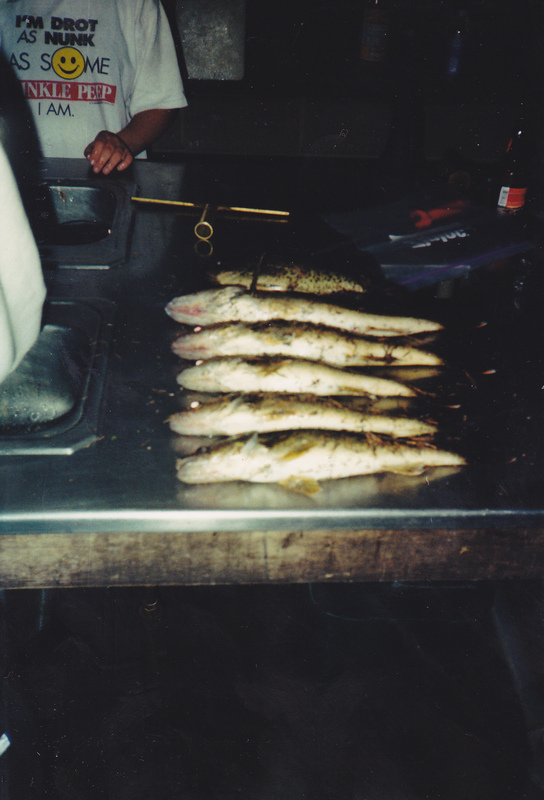 Some walleye’s laying on the fish cleaning table at the Fish Cleaning House at the campground. Running water and cleaning boards are provided. Please keep the place clean. Taking the hook out for my grandson Tyler. Typical bass at Bear Head Lake. 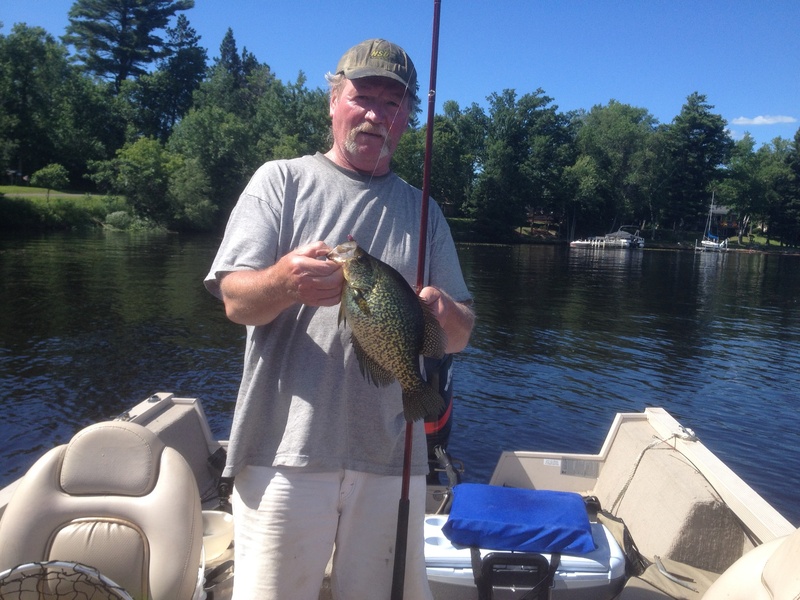 Got this one while fishing for panfish in the north arm of the lake. Nice eater walleye caught late in the day. 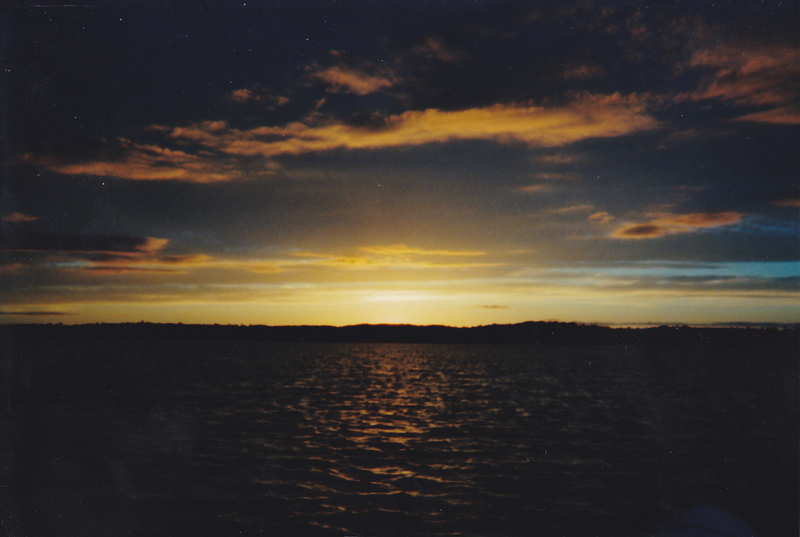 Couple of pics of some sun sets while fishing. 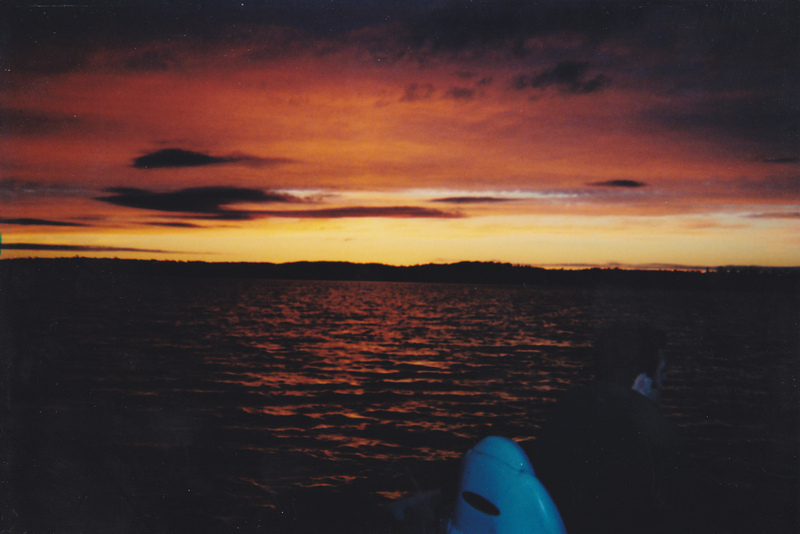 We were off the lake most of the time before darkness fell. We had plenty of action prior to dark. 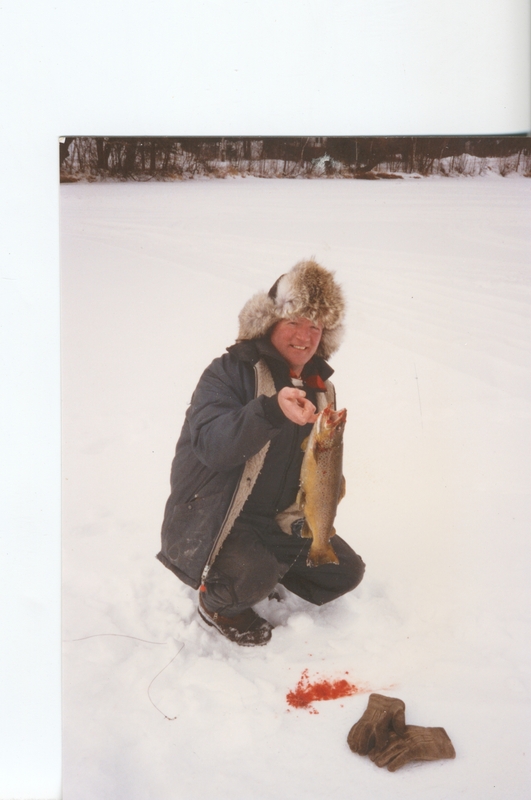 Showing off a walleye we caught in the morning hours. 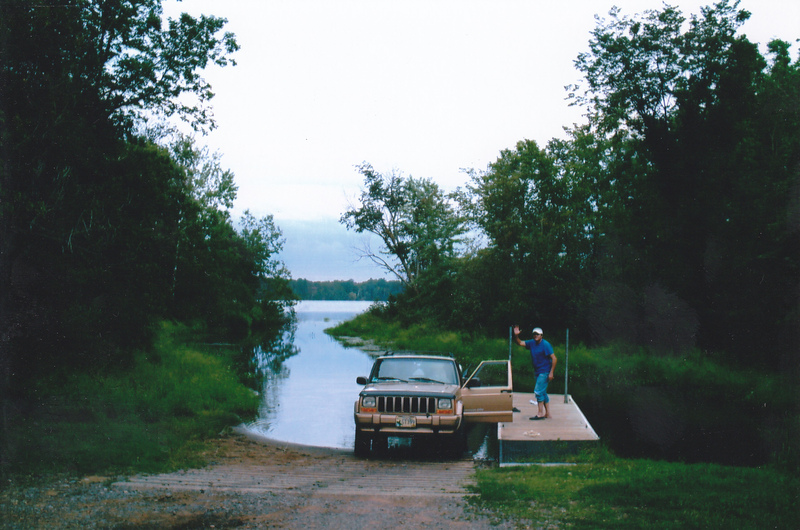 Have my boat secured by one of the boat docks near the campsites. You can see part of the boat landing in the background. 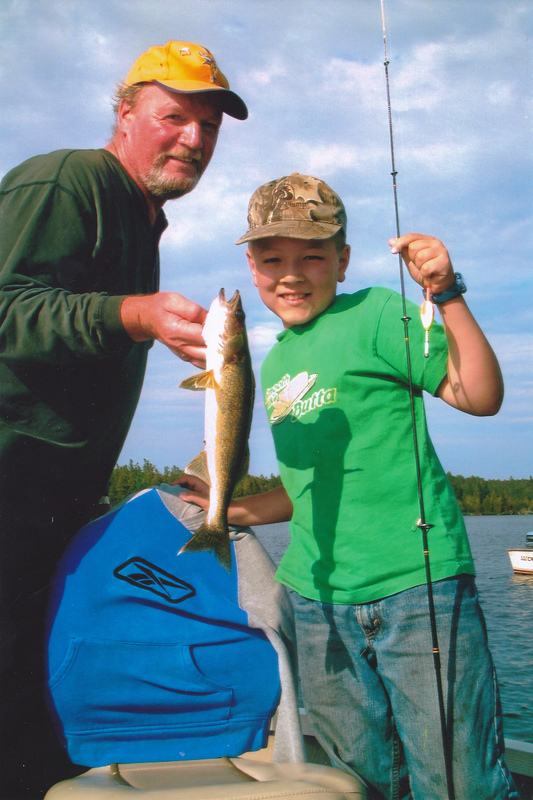 My grandson Tyler with another one of his walleye’s he caught during our stay. Releasing a 31 inch walleye near the campground. 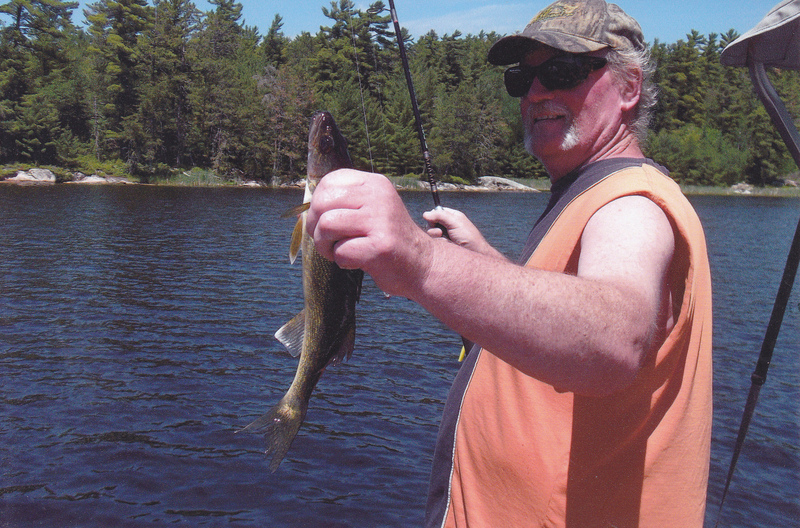 Don, who was with us on this trip caught this nice walleye and had a replica made of this fine fish. 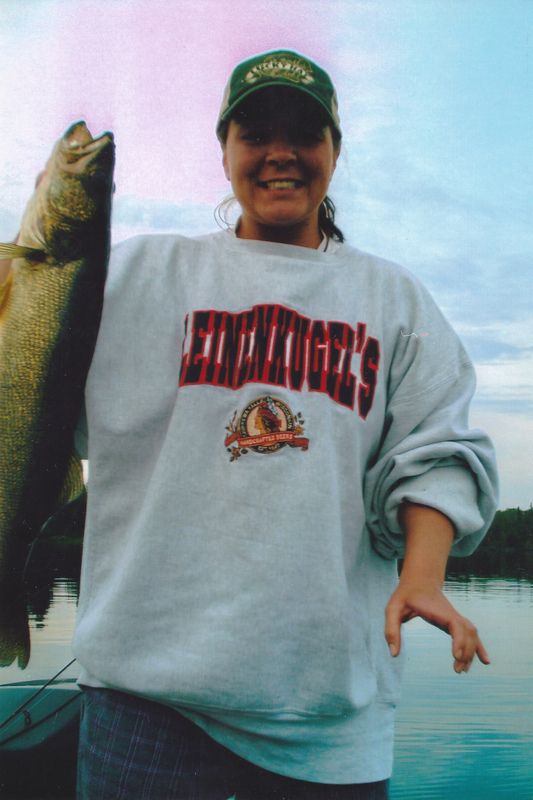 My daughter Kim with one of her bigger walleye’s of one of our trips at Bear Head. We released a lot of the walleye’s we caught [including larger ones like this] but kept some for shore lunch and some to take home. 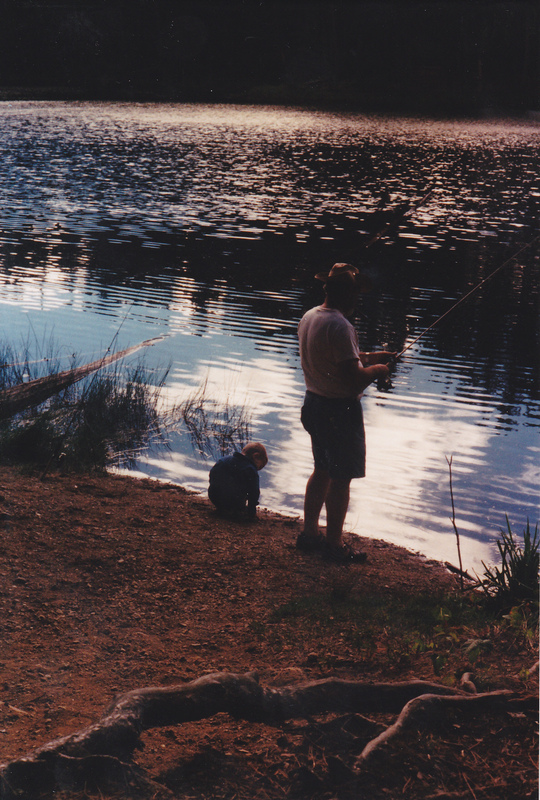 My brother and my grandson near the shore of the trout lake within the park. 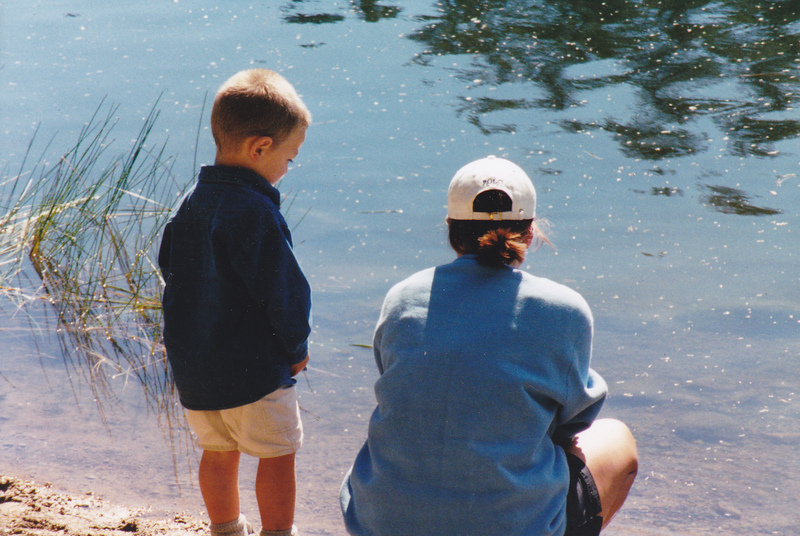 My grandson with his mom checking out small minnows near shore of the trout lake within the park a few years ago. 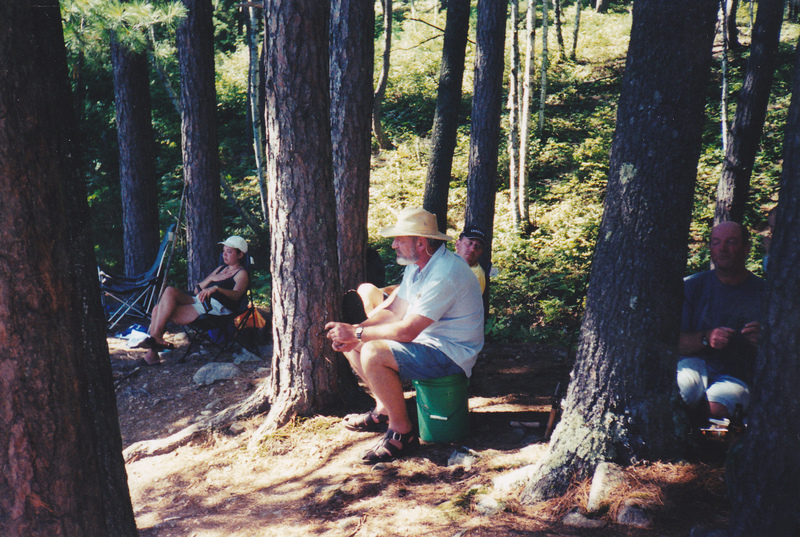 Couple of our favorite campsites at Bear Head. Couple more pictures of sunsets at Bear Head. One of the trout lakes within the park. Not very large but the lake does offer good fishing. Net full of eater walleye’s for one of our shore lunches. 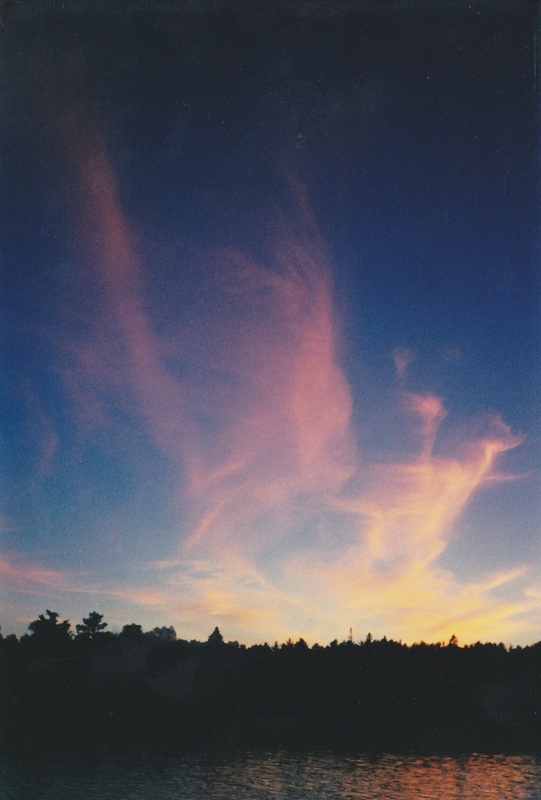 Cool cloud formation at sunset. Relaxing at the trout lake with the family watching for a trout to hit the crawlers. For more information on Bearhead State park and all other state parks there is a great site put out by our DNR. Take a virtual tour of Minnesota state parks, recreation areas, state trails, and even some of the state water trails. Panoramic, video, and snapshot tours are available for many locations. Take a peek and plan your trip!! www.dnr.state.mn.us/state_parks/virtual_tours.html. More to come………. going up next week for 4 days. THANK YOU for the info on your site. 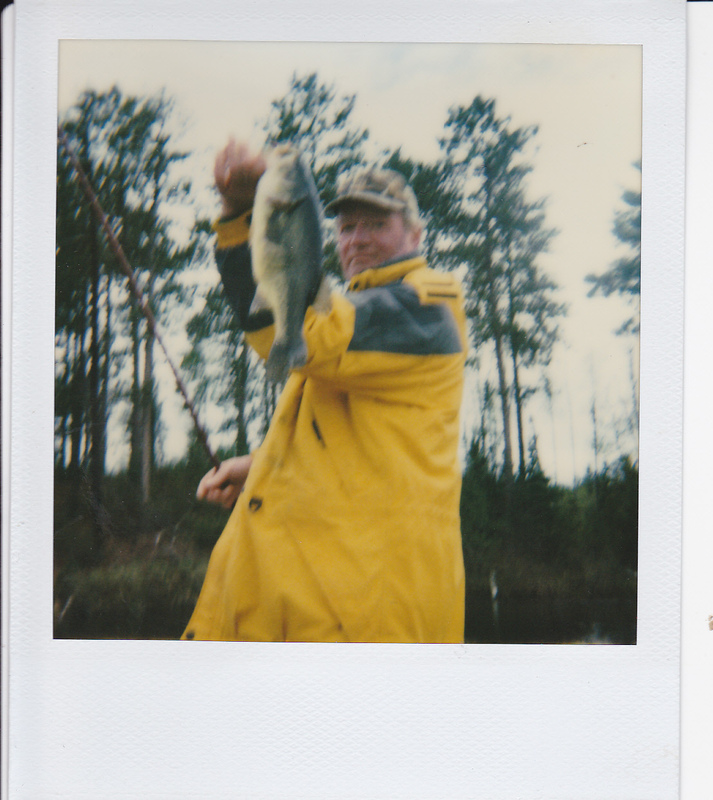 we are seniors and never been there so us and another couple are looking forward to fishing and enjoying the park, mostly due to some of your comments on the fishing web site. 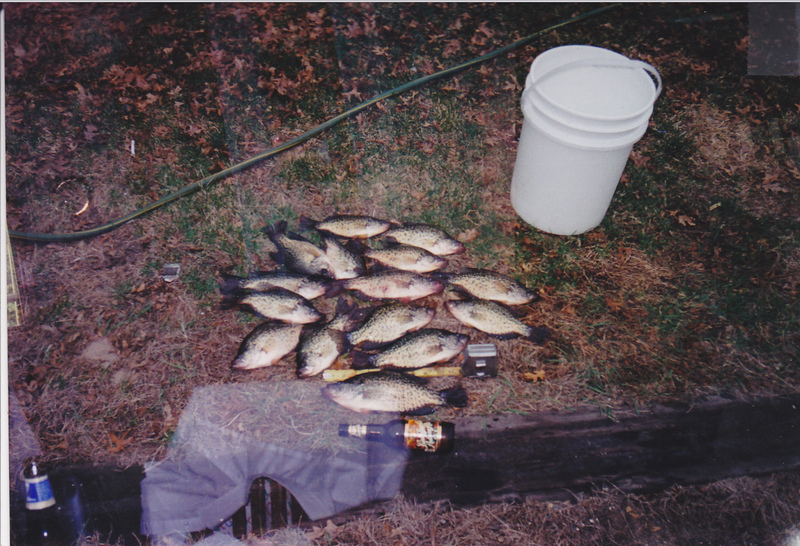 anxious to try the walleye fishing and of course panfish are always a blast! THANKS AGAIN! !